The name "Dotson" is Welsh in origin. But the surname was first found in Cheshire, where the family was seated from very ancient times, some say well before the Norman Conquest and the arrival of Duke William at Hastings in 1066 A.D. The name Dotson is a patronymic derived from the name Dodd or Dodds. The Coat of Arms features a silver shield with a blue bend engrailed between two Cornish chough, and the family motto is "In Copia Cautus," meaning "Careful amid plenty." Many Dotson family histories trace our lineage back to CHARLES DODSON, who lived during the 1600's in North Farnham Parish, Richmond County, Virginia.¹ He is the earliest known ancestor who can be proven in public and legal documents. But his ancestry is the source of a fierce debate. His descendents include actor Tom Hanks. The problem is that the Colony was growing so fast that it was practically impossible to keep faithful records. New immigrants arrived in Virginia in boatloads, almost every month in the year. By the year 1700, there were more than 80,000 persons living in the tidewater region of Virginia, when there had been only a handful in the day of John Dods. Between the influx of new immigrants, and official records stored in Richmond, being destroyed by fire, much of the genealogical work has to be left to family histories and church records. Until 1686, the Episcopal Church was the State church in Virginia. All children, regardless of religious affiliation, were required to be baptized by the minister of the church, like the parish that the Dodsons lived near in North Farnham.Ù Dates of birth and names of their parents were recorded in parish registers. The same information was taken of marriages and burials. The church records are preserved, and are available in the Virginia State Library in Richmond, Virginia. These records to not reveal the origins of Charles. But the fact of the matter is that Charles himself makes an impressive start to any genealogy. He was by all reports a successful, industrious, remarkably well-respected frontiersman. Fortunately, the records do show that between 1678 and 1680, Charles married a woman named ANN (last name unknown, but it was probably either ELMORE or DOTSON, b: 1654) in Rappahannock County. Charles prospered in Rappahannock, which became extinct in 1692, being divided into Essex and Richmond counties. Charles owned land in both counties, but actually resided in North Farnham Parish, Richmond County, Virginia.Ù He was a highly trusted neighbor, and witnessed many deeds and wills. An excellent example of ther esteem held for Charles is in the will of John Lincoln, dictated on Dec. 18, 1686, in which an affidavit reports that Lincoln "would have no other but Charles Dodson as his executor although several insisted that he have his wife." THOMAS DODSON was born in 1681 and married Mary Durham. They had the following children: George, who married Margaret Dagard/Dagood. Thomas, Jr. born early 1700s, married (1) Elizabeth Rose (2) Elinor, widow of John Sloan in Halifax County 1766, died 1783; Greenham, who married Elizabeth Hightower, daughter of John. 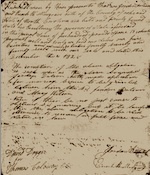 John Hightower appeared in a deed of Abraham Goad, Sr. in Richmond County; Abraham (1723-1768) , married Barbary Russell (b. 1729); Daughter Tabitha, born Abt. 1755, married Lt. Daniel Shumate before 1776; Winnie Dodson married William Scoggan Abt. 1763, who was killed at the battle of Yorktown. (Some say Winnie was a Johnston who had first married and divorced a Rev. William Dodson. ); Elisha, Sr.; Joshua, Jr. , Baptist minister, born 1725 in Richmond, moved to Fauquier County, Pittssylvania in 1771, then to Stokes County, N. Carolina; Alice married William Creel; and Mary, who married Mr. _?_ Oldham. BARTHOLOMEW RICHARD DODSON married Elizabeth Clarke before 1707, and they had a son James, born 23 Dec 1716, and a daughter named Elizabeth. Batholemew appeared as a witness on his mother’s will in 1718, but not a legatee. Perhaps had been given his share in her life-time. He sold the land he inherited from his father to his brother, Thomas, in May of 1734. WILLIAM DODS or DODSON was born in 1685 in Richmond County, Virginia, according to the Millennium File, Salt Lake City, UT, USA: Heritage Consulting. JOHN DODSON was born in 1687. He married Elizabeth Goad (b. 1695, daughter of Abraham and Katherine Williams-Goad). They acquired land in Frederick County, in Aug, 1756. 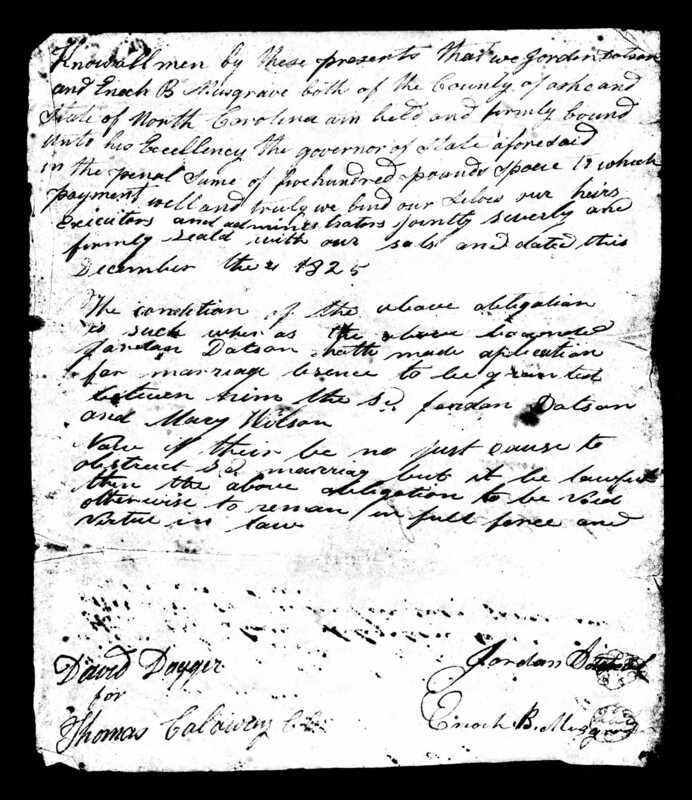 Will of 26 Aug 1784 in Shenandoah County, Virginia. They had the following children: Moses born 1729; Charles (he and Moses last heard of in 1753 as was Moses and both then disappeared); Martha Ann; Isaac; Peter; Elizabeth, who married John Cole or Kyle; and John Jr. John Sr. died in 1784. LAMBETH DODSON was born about 1689 in Richmond Co., Virginia. He married SARAH HARRIS (b. 1693, died 1736 in Richmond County). Lambeth left Richmond in 1739, and acquired land in Halifax County, VA, in 1747, 1755 and on the Mayo River in 1765. He died after 1780 in North Carolina. ANNE DODSON was born in 1692, in North Farnham, Richmond, Virginia. No further information, except that she receved a share of the moveable estate in her father's will. ELIZABETH DODSON was born in 1695, in North Farnham, Richmond, Virginia. No further information, except that she receved a share of the moveable estate in her father's will. Charles's growing family was expanding into new areas of the Colonies, along with the rest of this restless population. In the life time of Charles there were many new immigrants arriving in Virginia from England. They came in boatloads almost every month in the year. More and more settlements were established. By 1700 there were more than 80,000 persons living in the tidewater region of Virginia. During this time the colony was in almost constant trouble with their ruler, the English government and its representatives. Mainly the colonists objected to the arbitrary action of the colony officials and their ruthless demands. As new immigrants arrived, the frontier was pushed further westward until the settlements reached the mountains. As the people moved farther away from the royal governors, they gained more and more privileges and grew more independent. I Give and bequeath to my son Charles Dodson the plantation formerly called Coll?? Travers quarter with a hundred and fifty acres of Land to him and to the male heires Lawfully begotten of his body and if the aboves Charles Dodson should Die without any male heirs that then the Land should Returne to the next heire of the Dodson. Seventhly. I Give and bequeath to my Deare and Loving Wife Anne Dodson and my daughters Anne Dodson and Elizabeth Dodson all my moveable Estate of what kind soever within and without to be Equally Divided betweene them. Ann and their daughters received "all my moveable estate of what kind soever within and without." The list of possessions were appraised and included chests, chairs, tables, cloth and linen napkins, two spinning wheels, a pestle and mortar, knives, cart wheels and casks. One of the more expensive items, valued at 2200 (shillings?) was "one servant man three years eight months to serve" so Dodson obviously had an indentured servant on hand. Of those six sons listed in the will, our ancestor is the sixth, LAMBETH (or LAMBERT) DODSON, Sr., who was born around 1689 in Richmond County, Virginia. He married a woman named SARAH HARRIS between 1720 and 1723. Starting around 1750, people from eastern Virginia began moving into an area along the Dan River in southern Virginia, and Dodson families joined the early migration, according to a small booklet for land entries in Halifax and Pittsylvania (formed from Halifax in 1766). Lambeth apparently left Richmond before 1739, as his name disappears from the record there. But in the 11th of November, 1747, he had acquired a 190 acre plat on Falling Creek, Halifax County. In the same book (Plat Book 1), is a plat for 400 acres on Sandy Creek, dated 17 Feb 1755, on the Mayo River in Pittsylvania Co. The land was transferred to George Gibson a year later, (so either Lambeth had died, or Gibson may have been a son-in-law). LAMBETH DODSON, JR., was born around 1710. MARY DODSON was born on 3 Apr 1724. ISAAC DODSON was born in 1730. He married Jennet Aubrey (?). 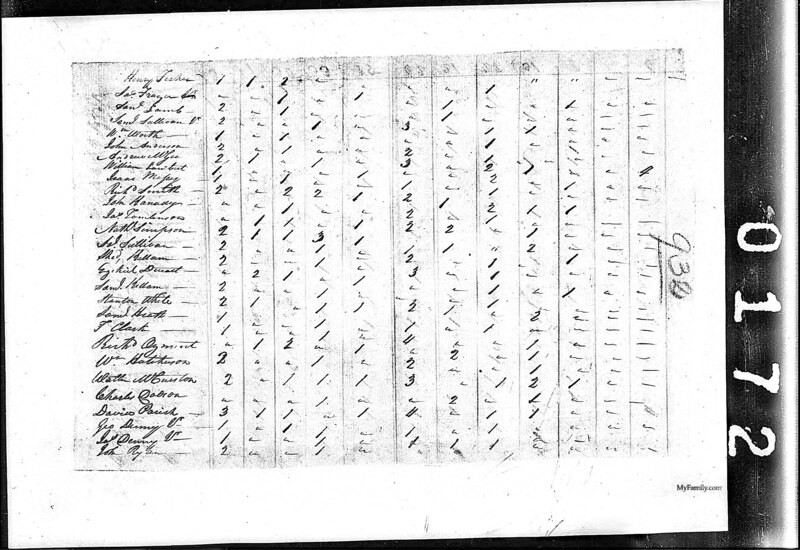 Children: Joshua Dodson b: BEF 1768 in Pittsylvania Co.,Va. 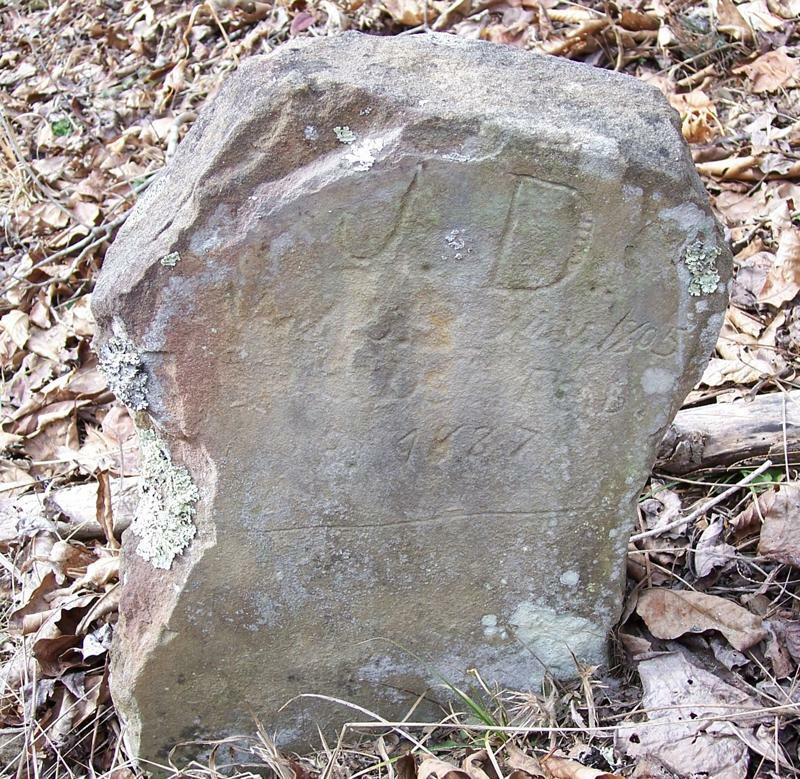 JOHN DODSON was born in 1721, and died in White County, Tenn. (age 109 ??). Wife unknown. He had a son, Jesse, born in 1784 who had Samuel born 1831 who lived in Van Buren County, Tenn. A Rev. Jesse lived in Grainger, Hawkins and Claiborne counties, Tenn. and ended up in McMinn and Polk counties, Tenn.
CHARLES DODSON. A small booklet for land entries in Halifax and Pittsylvania (formed from Halifax in 1766) lists Charles as a land owner in 1753. 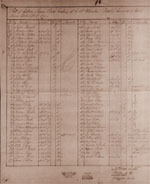 Charles first appears on his own in an early North Carolina tax list, in Rowan County, in 1768, and then again in the 1771 tax list of Surry County, North Carolina, when he is taxed for two polls (Reuben and John Dodson were also on the list). In 1772, he was assessed for three polls (Reuben remains on the list, but John is gone) the Surry co. tax lists for 1773 are missing, but in 1774, Charles is not listed (through Reuben remains) in Charles McAnally's District. DANIEL DODSON married a Harris. 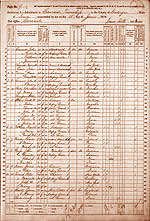 Daniel appears on the 1782 Virginia tax list with a family of nine. 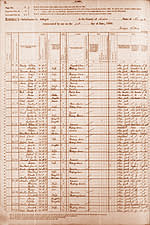 GEORGE DODSON is listed as living alone in the 1782 Virginia tax list. When Pittsylvania County was created in 1766, some Dodsons fell into the area of the new county, others remained in the section that was still Halifax. Records for both counties in the ensuing decades record a considerable number of Dodsons. Generally speaking, the Dodson families lived in the southern half of the county. Lazarus, George and Thomas were on the same list, and Thomas was tithed with eight slaves. Meanwhile, their brother LAMBETH DODSON, JR., was on a separate list. He and his wife, ELIZABETH, lived between the Patrick and Henry Counties on the North Carolina state line in the early-to-mid 1700's. Lambeth Jr. patented land in Guilford Co NC in 1779, some of which was sold by Lambeth Dodson of Henry Co VA to Zachariah King in 1784; another part of this land was sold by Dodson heirs in 1814. The Surry Co. tax list for 1775 are about two thirds complete. there are no Dodsons on Charles McAnally's very incomplete list; Reuban Dodson is on Camplin's list and George Dodson is on Benjamin Clevelands's list. Charles Dodson was not listed in 1775. There are no Surry County tax lists for 1776. In 1777, Charles Dodson re-appears on the tax lists in Jabez Jervis' District. (This district covered an area presently in Wilkes County.) No other Dodson's are on the 1777 tax lists for Surry, which are estimated to be about one-third complete, so others may actually have been living there. CHARLES DODSON was born in 1740/1750. He served in the Virginia and North Carolina Militias during the American Revolution. ESAU DODSON was born about 1754. He died after 1832. RICHARD DODSON died about 1829 in North Carolina. Richard married Mary. They had the following children: Charles DODSON; Jeremiah DODSON; Richard DODSON Jr.; Sally DODSON; Mary DODSON. REUBEN DODSON married Agnes WHITLOCK on 10 Feb 1780 in Surry Co, North Carolina. Agnes was born on 24 Feb 1758 in Albermarle Co, Virginia. She died on 7 Jan 1855 in Roane Co, Tennessee. They had the following children: Alexander DODSON; Obediah DODSON was born before 1775. George Washington DODSON was born about 1783 in North Carolina. He died about 1842 in Lawrence Co, Indiana; George married (1) NEAL on 15 Jan 1807. George married (2) Mary THOMPSON on 13 Aug 1815; Lambeth DODSON was born about 1788 in , , , North Carolina. He died on 1 Oct 1838 in Lawrence Co, Indiana. Lambeth married (1) Patsy DEATHERIDGE on 19 Aug 1817 in Stokes Co, Indiana. Lambeth married (2) Nancy GROVES on 2 Mar 1828 in , , Lawrence Co, Indiana; Sabrinah DODSON was born about 1777 in North Carolina. Sabrinah married (1) George NEAL. Sabrinah married (2) Robert HALL on 16 Dec 1824 in Lawrence Co, Indiana; Mary DODSON was born in 1774. 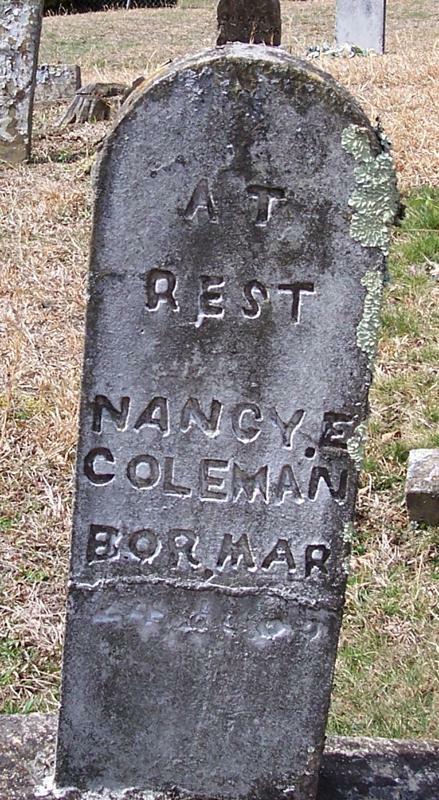 She died in 1850 in Stokes Co, North Carolina. Mary married TILLEY. TILLEY was born in 1770 in King William Co, Virginia. He died on 25 Mar 1859 in Stokes Co, North Carolina. WILLIAM DODSON b. March 29, 1758, Virginia; d. Aft. 1830, White County Tennesse. He married (1) TIBITHA HENDRICK. Children of WILLIAM DODSON and TIBITHA HENDRICK are: SIMON DODSON, b. Abt. 1780, Virginia; WILLIAM "BUCKY" DODSON, b. February 02, 1793, Halifax Virginia; d. May 09, 1861, Elamsville ,Patrick County Virginia; m. JUDITH DIXON, Abt. 1817; ELI DODSON, b. 1798, Halifax County, Virginia; d. March 17, 1828, White County, Tennessee; DANIEL DODSON, b. Abt. 1790, Virginia. Then William married (2) MARTHA PECK. She was born Abt. 1760. He served in Virginia and North Carolina Militias during the American Revolution. 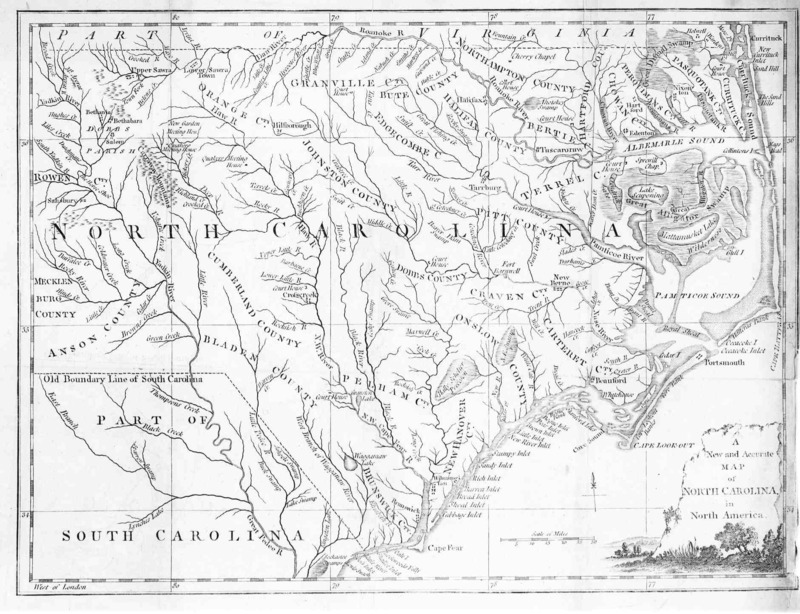 A map of North Carolina in 1779. The border with Virgina, where our Dotson ancestors lived at the time, is on the upper part of the map (click to enlarge). Typical soldier in the North Carolina Militia, as painted by Don Troiani. In March of 1775, Patrick Henry gave his "Liberty or Death" speech in support of his resolution to raise forces to defend Virginia against the British at the Second Virginia Convention at St. John’s Church in Richmond. In April, 1775, the people of North Carolina drove the royal governor out of the colony, and in May the citizens of Charlotte, Mecklenburg County, North Carolina, declared the British government suspended. The opposing sides took on the name of English Parliamentary parties. The "Whigs" were the patriot side and the "Tories" were the Loyalists. War with Britain was imminent. 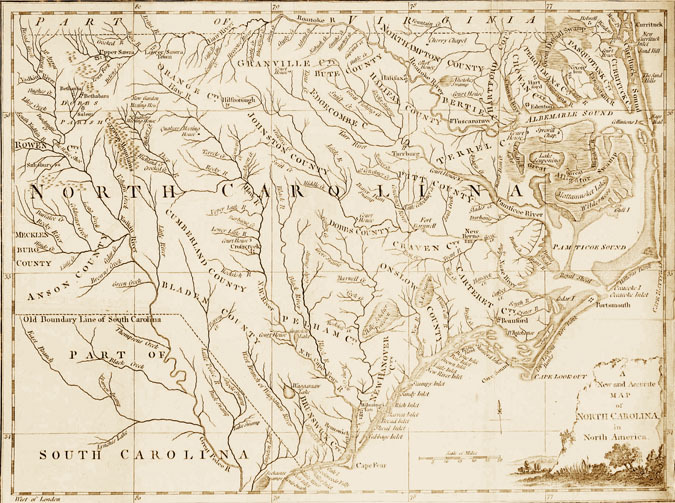 In 1776, North Carolina became the first colony to vote for independence from England, and Virginia followed in May. Young men from across the Colony signed up to fight. The Dotson land stretched across the border of both states. To the north, Colonial Virginia did not maintain a standing army. Nearly everyone was engaged in agriculture, and needed to plant in the spring and harvest in the fall. The Virginians were not wealthy enough to afford full-time soldiers. Whenever there were colonial "alarms" about the British, pirates or Indians, riders on horses would spread the word to various farms and the men would assemble as needed. Charles actually fought in the militias of both North Carlina and Virginia. When one understands the geography of this region (shown in the map, above), it is easy to see that residents responded to the geography, not necessarily to the civil boundaries. The original Lambeth Dodson land that had been handed down to Charles probably spanned the boundaries of Virginia and North Carolinaso in truth, they may have been uncertain in which state they lived, so answered the call that came the loudest. When the British were attacking and threatening the lives of his family, Charles looked for a rifle, not a boundary line. Virginia Militia, as painted by Don Troiani. In 1777, Charles signed an oath of allegiance in Henry County, Virginia. He and brother William Dodson then both served in the Virginia Militia, in Harmon Critz' Company from Henry County. In the summer of 1780, the company marched against the Tories and pursued them as far as the Yadkin River. 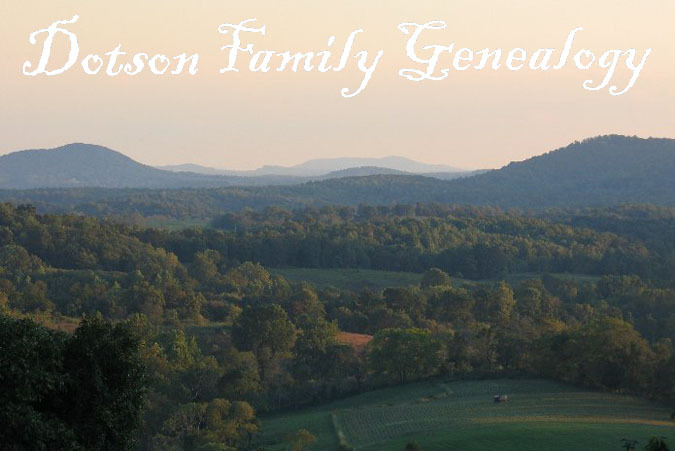 On March 11, 1781 the company was ordered to assist General Greene in North Carolina, and fought at the battle of King’s Mountain (although the Dotson brothers are not recorded as having fought in the battle). That battle was fought by 1,000 plus militiamenwithout orders, formal military training, uniforms or provisions, and with no promise of payagainst the supposedly “superior forces” of noted English Col. Patrick Fergusonand is credited by most early historians with having changed the course of the Revolution in the South. Ferguson (the only English regular on the fieldthe rest of his men were Tories recruited from the Carolinas and Virginia) had sworn death and destruction to all Patriots (and their families) living across the mountains. The 'Over the Mountain Men,' from the wilderness of Tennessee, Virginia, and North Carolina, took offense at this. "They had a finely honed sense of vengeance, and didn't fight fair." One account of the Henry County Militia in the American Revolution was recorded by Judith Parks Hill who wrote a History of Henry County, Virginia, recorded in 1925: "On March 11, 1781, Colonel Penn and his men marched from Beaver Creek in Henry County, crossed Rowland's Ford just below Fontaine, followed the old road, deep cuts now showing its location, up Marrowbone Valley crossing the creek west of where Ridgeway now stands, thence along the ridge two miles, then crossing Matrimony Creek half a mile to the state line, only one mile from the Marrowbone home of Old Rusty Hairston to the National Highway is now used for public road. From the line south is not known, however, they marched so rapidly they soon reached General Lord Cornwallis a few miles north of Greensboro, North Carolina, and begin what became known as the Battle of Guilford Court House on March 25, 1781. General Green said our men would fight, get beat, rise, and fight again. This American defeat helped win the War for Independence as the casualties for the British forces represented 27 % of the British troops and the American losses amounted to only 6 % of the total forces engaged. Lord Cornwallis said 'another victory such as this would ruin the British Army.'" The Battle of Kings Mountain, as painted by Don Troiani. SOURCE INFORMATION: National Archives. 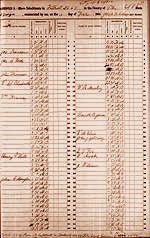 Personnel, pay, and supply records of American Army units in the Revolutionary War, '75-'85. In 1778, Charles and Reuben Dodson were on the roll of Reed's Company, 1st North Carolina Battalion, Thomas Clarke commander, both serving as privates. 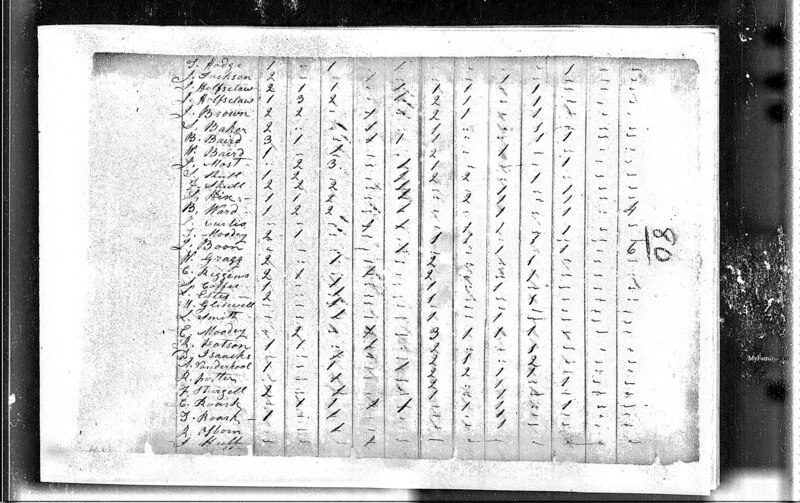 One of the muster rolls can be seen at right. 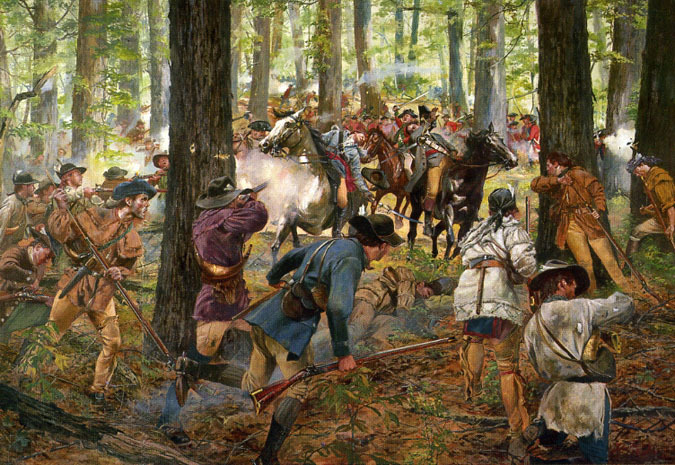 The militia defeated Tory forces at the Battle of Moore's Creek Bridge in February 1776, the first military action in North Carolina and the last until near the end of the war. In March 1781, American forces under General Nathanael Green defeated Lord Cornwallis' forces at Guilford Courthouse, which forced the British to vacate the Carolinas. But there was always action on the Virginia side of the border. The record of Henry County, Virginia, show that Charles Dodson was on the tithable list for that county beginning in 1778 assessed one white poll. In 1789, Charles is taxed for 2 polls aged over 16 and under 21 years of age; indicating that he possibly had 2 sons born between 1768 and 1773. After the war, Charles went back to farming full time. His residence was listed in North Carolina for the 1790 Federal Census, but the pages for the area he lived in, Granville County, were lost. 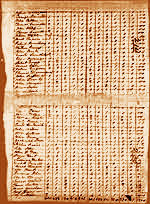 The census was later reconstructed from tax lists. Charles' entry in the 1800 census is still available, however. 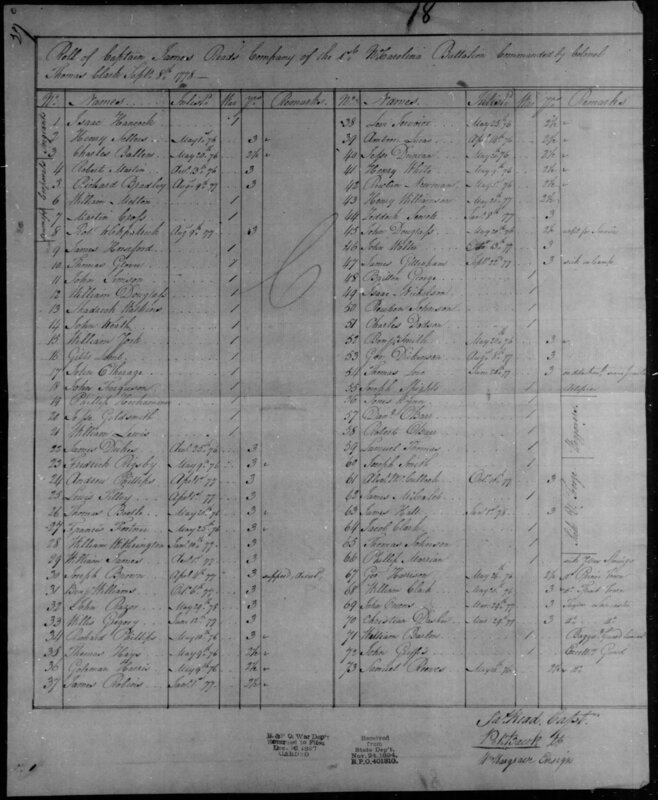 SOURCE INFORMATION: 1790 & 1800 US Census Records. 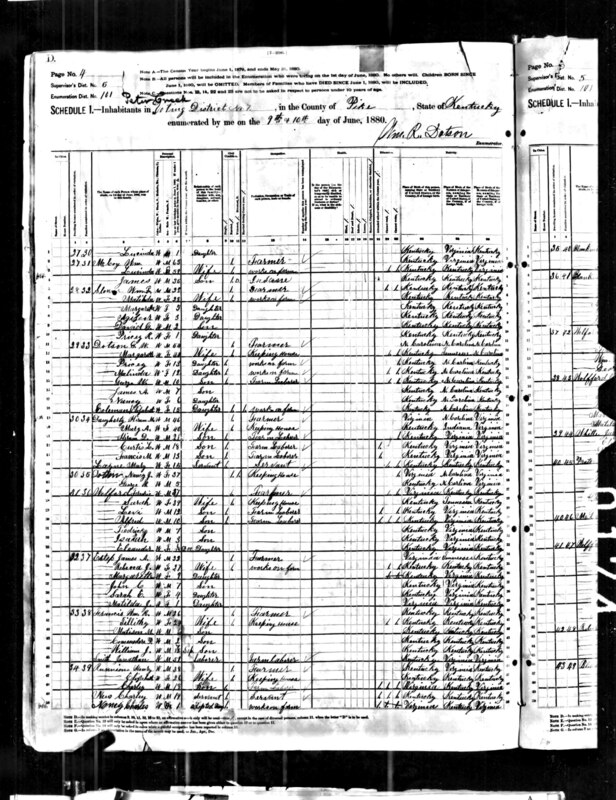 Index created from United States of America, Bureau of the Census. Charles sired at least three sons: REUBEN DOTSON, whom was born sometime around the year 1775, Charles and James. We know next to nothing about the last two sons, and even less about their mother (many North Carolina records from this period have been lost, so it's doubtful that we'll ever know anything). SOURCE INFORMATION: 1850 United States Federal Census. M432, 1009 rolls. National Archives and Records Administration, Washington DC. Reuben was a farmer, unable to read or write. In the 1815 North Carolina census, Reuben owned 100 acres of land adjoining John Estep. (This area became Watauga County, North Carolina, in 1849.) In 1820, Reuben Datson was listed in Franklin, Williamson County, Tennessee (Roll: M33_125; Page: 170; Image: 179). Reuben was in Carter Co., Tennessee in 1830 (the part that became Johnson Co. in 1836). He lived on Roan's Creek along the state line between Johnson County, Tennessee, and Ashe County, North Carolina. Records indicate that Reuben and some of his children simultaneously owned land in both states. His old home was at "Bulldog," a side road just below Trade, Tennessee. 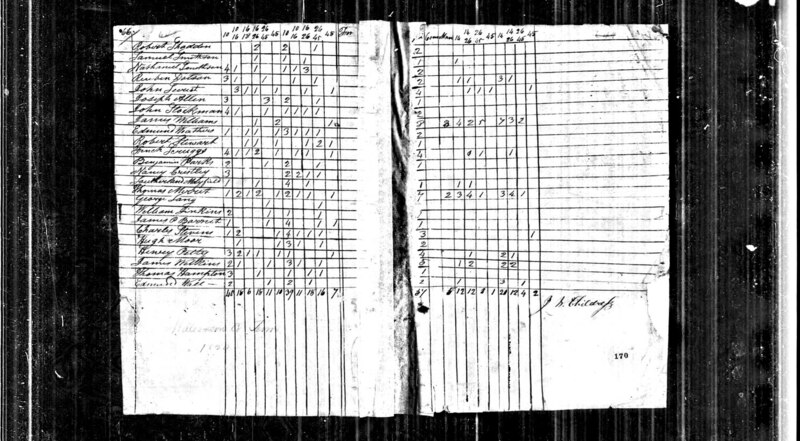 By the 1850 census, shown at right, Jordan lived on a $200 farm property in what was by then the state of Tennessee, with his wife and daughter, Malinda. They lived next to the family of his son, Reuben Jr.
Reuben died 28 Jan 1869 (age 104 years), according to the family records of Verna Dotson. (Her records say he was born in 1765, which is in conflict with census records.) Family records give the name of his wife as Nellie Green, though she is shown as Sarah on all census records. The wife, Sarah, as shown on census records was born c. 1782/85 in North Carolina and died after 1860. Her death is not recorded in the family records. JORDAN DOTSON was born in 11 Nov 1805 in Ashe County, North Carolina. on 4 Dec 1825 he married Mary "Polly" Wilson in Ashe County, North Carolina. He died on 2 Feb 1887 in Coleman, Pike County, Kentucky. He's buried in the Coleman/Dotson Cemetery. Family listed below. WILLIAM E. "BILLY ARNOLD" DOTSON was born on 10 Jan 1801. He married Rhoda Stout and they had two children: Godfrey Daniel Dotson (b: Abt 1827 in NC), and Elijah Dotson (b: Abt 1846). He married a second time, to Elizabeth Bumgardner (b: 1817 in NC), on 27 Jan 1845 in Ashe Co., NC. They had the following children: Elizabeth D. Dotson b: 1845 in Ky; Mary Dotson b: Abt 1847 in Va; John C. Dotson b: 1850 in Tn; David H. Dotson b: 1852 in Tn; Barbara Dotson b: 1854 in Tn; Rebecca Dotson b: 1856 in Pike Co., Ky; Matilda Dotson b: 1858 in Pike Co., Ky. William died in 1875 in Paw Paw, Pike County, Kentucky. ELIJAH DOTSON was born in 1810. He married a woman named Anna (b: 1814 in NC) in 1835 in NC. They had the following children: Sarah Dotson b: Abt 1836 in Nc; Allen Dotson b: Abt 1838 in Nc; Nancy Dotson b: Abt 1840 in Nc; Alison ? Dotson b: Abt 1842 in Nc; Anna Dotson b: Abt 1849. ALLEN DOTSON was born in 1815-1817. He married Delila Pearce (b: 15 Apr 1822) on 25 Feb 1843 in Ashe Co., NC. They had the following children: George W. Dotson b: 24 Jun 1841 in Johnson Co., Tn; William Green Dotson b: 4 Jul 1843 in Nc; Sarah Fine Dotson b: 19 Sep 1845 in Johnson Co., Tn; Malinda Dotson b: 12 Nov 1847 in Tn; Alfred A. Dotson b: 26 Jan 1850 in Johnson Co., Tn; Eadia C. Dotson b: 16 Oct 1851 in Johnson Co., Tn; John F. Dotson b: 23 May 1854 in Johnson Co.,Tn; Albert E. Dotson b: 24 May 1856 in Johnson Co., Tn; David S. Dotson b: 13 Aug 1859; Nancy Elizabeth Dotson b: 11 Sep 1866. He died on 8 Dec 1899 in Johnson Co.,Tn. REUBEN DOTSON, JR., was born in 1824. He married Sarah (Sallie) Johnson on 1 Oct 1844 in Ashe Co., North Carolina, and they had the following children: William R. Dotson b: Abt 1845 in Nc; Nancy A. Dotson b: Abt 1847 in Tn; (General) Jordan Dotson b: Abt 1849 in Tn; Sarah Malinda Dotson b: Abt 1855 in Tn; Reuben H. Dotson b: Abt 1856 in Tn; Mary E. Dotson b: Abt 1857 in Tn; Allen F. Dotson b: Abt 1859 in Tn; Mary J. Dotson b: Abt 1861 in Tn; Delilah L. Dotson b: Abt 1862 in Tn: Martha C. Dotson b: Abt 1869. GEORGE WHEELER DOTSON was born on 16 Nov 1824. He married Katherine Bumgardner (b: Abt 1825 in NC) on 29 Jan 1850 in Pike, KY. They had the following children: John S. Dotson b: Abt 1845 in Tn; Sarah Dotson b: Abt 1847 in Va; Reuben F. Dotson b: Abt 1849 in Tn; David H. Dotson b: Abt 1852 in Tn; Allen Dotson b: Abt 1855 in Tn; Martha Dotson b: Abt 1859 in Tn; Peter L. Dotson b: Abt 1861 in Ky. Married again, to Margaret Estep (b: Abt 1834 in Va) on 31 Jan 1850, in Pike Co.,Ky, and had the following children: Elizabeth Dotson b: Abt 1864 in Ky; Pricey Dotson b: Abt 1866 in Ky; Melinda Dotson b: Abt 1868 in Ky; George W. Dotson b: Dec 1869 in Pike Co., Ky; James A. Dotson b: Abt 1873 in Pike Co., Ky; Nancy Dotson b: Abt 1874 in Pike Co., Ky. He died on 04 Oct 1909 in Fedscreek, Kentucky. MALINDA DOTSON apparently never married. She's on the 1882 tax lists of Johnson County as a property holder. SARAH FINE DOTSON was born in 1830 in Carter Co., Tn. She married William R. Barry on 21 Mar 1847, in Johnson Co., Tn. EADY DOTSON married Joseph Pearce on 28 Oct 1840 in Ashe Co., NC. No further information. RACHEL DOTSON married Abraham Willson on 17 Aug 1841 in Ashe Co., NC. DICY DOTSON married William A. Williams on 14 Feb 1850 in Johnson Co., TN. Reuben's son JORDAN DOTSON married MARY "POLLY" WILSON (b. Mar 1807 in Randolph Co., North Carolina; d. 12 Jan 1901) on December 4, 1825, in Ashe County, North Carolina. Pike County is a secluded region in the extreme southeastern corner of Kentucky, rich in coal and hardwood timber, nestled in hills that rise to meet the Appalachian Mountains. It was founded on December 19, 1821, and the county was named for General Zebulon Pike, the explorer who discovered Pike's Peak. The town of Phelps was named after an early frontier family who settled in the area. Many Dotsons, most of them Jordan's descendents, still live in the area today. SOURCE INFORMATION: North Carolina County Registers of Deeds. Microfilm. Record Group 048. North Carolina State Archives, Raleigh, NC. Jordan applied for homestead land on Big Branch, on January 25, 1851, and received 100 acres. 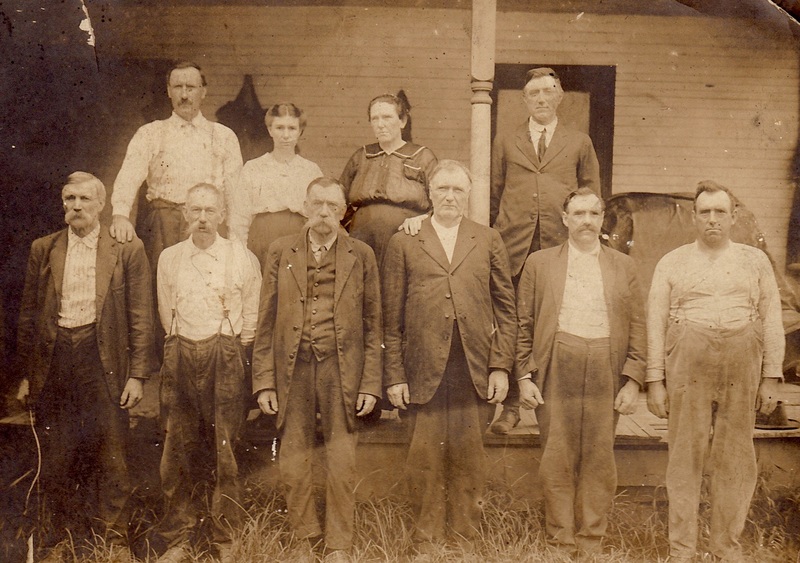 They worked a farm near Peters Pond, and their family became closely allied with branches of the Stump, Coleman, and Hatfield families (our line later married into the McCoy family, meaning we had lots of family actively involved on both sides of the famous Hatfield/McCoy feud). After bringing the family to Kentucky, Jordan lived a long life, surviving feuds, the Civil War, and Reconstruction, and finally died on 2 Feb 1887. He is buried at Dotson Family Cemetery, Phelps, Pike County, Kentucky, at the foot of John Creek mountain (LOCATION: near the last house on right going up toward mountain, there is a gate with a path cut about 10 feet wide 400 feet up on hill). Jordan is buried there with his wife, rough-cut stones marking their graves. JOHN DOTSON married Sarah "Sally" Charles (b: 1830 in Ky) on 5 Apr 1849 in Coleman, Pike Co., Ky. 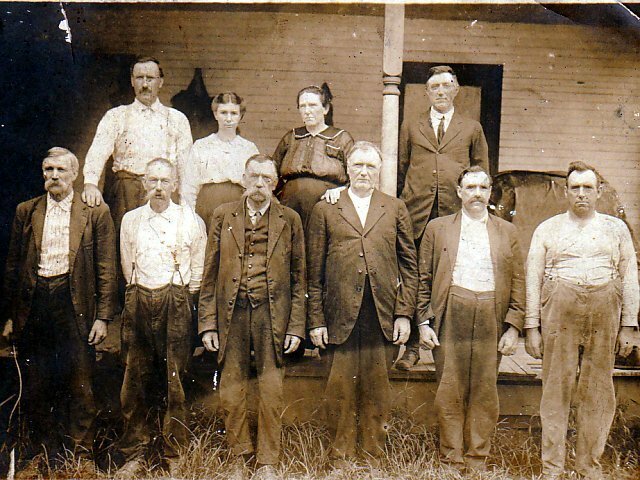 They had the following children: George W. "Redneck" Dotson b: 1855 in Pike Co.,Ky; David Dotson b: 1861 in Pike Co., Ky; Harrison Dotson b: 1860 in Pike Co.,Ky; Elias Dotson b: Abt 1854 in Pike Co., Ky; Malinda Jane Dotson b: Abt 1857 in Pike Co., Ky; America A. Dotson b: 1865 in Pike Co., Ky; Rebecca Dotson b: Abt 1850 in Pike Co., Ky; Pricey Dotson b: 1851; Mary Dotson b: 1863; Rachael Dotson b: 1853; and Amanda Dotson. REUBEN DOTSON (b. 1830) married Matilda Ann Coleman (b: 1835) on 23 Mar 1851 in Pike Co., Ky. They had the following children: George Washington (15 Jan 1859 - 1949); Daniel Jeams (b. 1854/1856); Ransom (8 Mar 1869 - 13 Dec 1954); Jordan Dotson b: 1857; Elkanah "Cain" (1867-1939); William H. Dotson b: 1861; Moses Dotson b: 1874; Aaron Dotson b: 1874; Reuben Walter (1865-1922); Matilda "Sis" Dotson b: 1872; Sherman (15 Aug 1876 - 21 Jul 1953) and Louisa Kaldone "Done" Dotson (b. 1879). 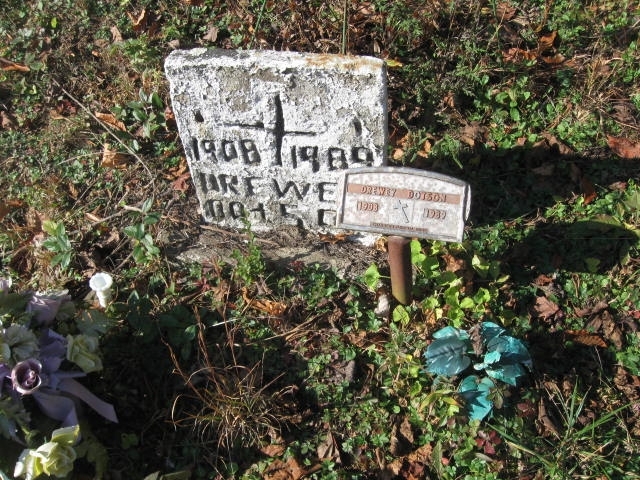 Reuben and Matilda Ann are buried at the Old Dotson Cemetery in Phelps, Pike County, Kentucky. ELIJAH DOTSON (b. 1833) married Elizabeth Charles (b: 1836 in Ky). They had the following children: Jane Dotson b: 1854 in Pike Co., Ky; Mary Dotson b: 1854 in Pike Co., Ky; David Dotson b: 1857 in Pike Co., Ky; Minda Dotson b: 1866 in Pike Co., Ky; Ransom Dotson b: 1868 in Pike Co., Ky; Marinda Dotson b: 1870 in Pike Co., Ky; Bazzel Dotson b: 1872 in Pike Co., Ky; and John Dotson b: 1874 in Pike Co., Ky.
SARAH "SALLY" DOTSON, who was born in December of 1834. She married DANIEL "BONE" WOLFORD. GEORGE W. (WHEELER or WASHINGTON) DOTSON was born in 1837. He married NANCY J. DAUGHERTY (b: 1843 in Va) on 1 Aug 1861 in Coleman, Pike Co., Ky. Family listed below. He died in 1875 in Pike Co., Kentucky. RACHEL DOTSON, b. 1839, married Moses "Mose" Coleman (b: 1826) on 29 Jun 1854, in Coleman, Pike Co., Ky. They had the following children: Reuben Coleman; Sarah Coleman; Elige Coleman; Arminda Coleman; Joe Coleman; Green Coleman; Nancy Coleman; and Rene Coleman. JORDAN DOTSON JR., b. 20 May 1845 in Raleigh, North Carolina. He married Rhoda E. Stump (b: 1847 in Va) on 9 Jun 1865 in Johns Creek, Pike Co., Ky. They had the following children: George B Dotson (1867-1942), W N Dotson (1867-1868), James Ellison (1870-1939), Elizabeth Betty (b. 1871), Anderson (1873-1950), and Mary Catherine Dotson (1877-1979). Jordan fought for the Union in the Civil War, in the 39th Regiment, Kentucky Infantry, Company H; Rank: Private; Alternate Name: Jourdan/Dotson (Film Number: M386 roll 8). On 27 Sep 1877 he married Surilda Alice Hager (1859-1923), and they had the following children: Floyd (1878-1942), Elias (1878-1963), Boya (b. 1880), Sarah (1881-1889), Mary (1882-1882), Margie (1883-1956), Louisa (1884-1885), Paris W (1885-1968), Florence (1886-1951), Roland (1888-1973), Reuben (1890-1899), Margie (1892-1954), and Christopher Columbus Dotson (1894-1970). (See their family here.) 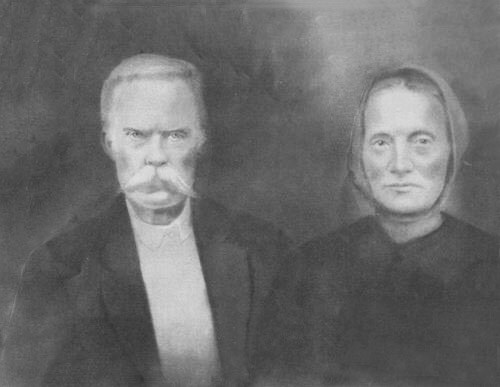 Jordan married again on 4 Nov 1895 to Sarah Ann Hatfield (1858-1929) in Pike, Kentucky (click here to see a drawing of them together). They had the following children: Lee Scott (1896-1984), Elizabeth "Lizzie" (1897-1977), Phillip Dewey (1898-1971), Gustavia "Pet" (1900-1972), Octavia (b. 1902), and Claudia Dotson (1902-1986). 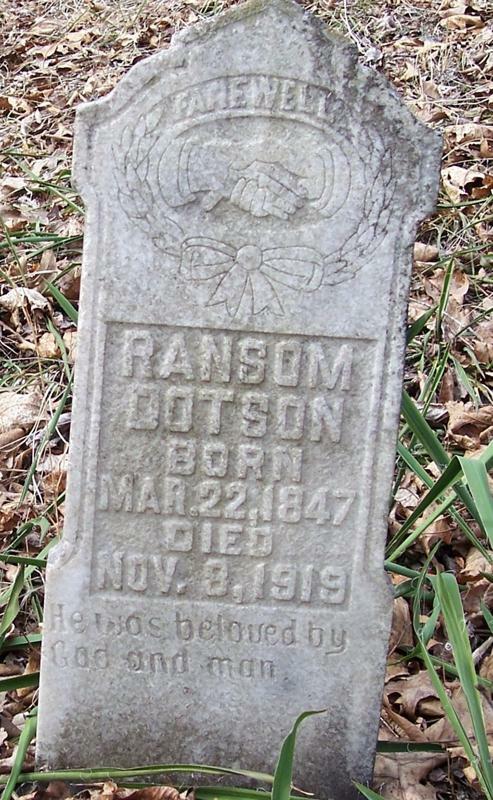 RANSOM DOTSON was born 22 Mar 1847. He married Louisa Jane Coleman (24 Sep 1855 - 1945) and they had the following children:Walter Dotson b: 11 Nov 1885; Garfield Dotson b: 16 Jul 1880; E. Burbage Dotson b: 1 Apr 1882; Rhoda Dotson b: 18 Jun 1872; Nancy L. Dotson b: 2 Sep 1873; Columbis Dotson b: 15 Nov 1873; Perry Dotson b: 16 Oct 1878. Ransom died on 8 Nov 1919 in Coleman, KY, and is buried at the Dotson/Coleman cemetery in Pike County, near his mother and father. NANCY DOTSON, was born in Feb of 1852 in Kentucky. She married Curtis Coleman (7 Mar 1849 - 21 Oct 1899) on 7 Apr 1870 in Pike, Kentucky. They had the following children: James Nelson (b. 1871); Cylvania (b. 1876); Luency J (b. 1878); George Henry (1880-1948); Malinda Arizona (1882-1967); Clemmentine (1887-1976); Louisa (1891-1968); Roma (b. 1893); and Daniel Wayne (b. 1897-1971). She is buried at the Coleman-Dotson Cemetery in Jamboree, Pike County, Kentucky. The grave of Jordan Dotson at the Old Dotson Cemetery in Phelps, Pike County, Kentucky (click to enlarge). By 1860, a Civil war was brewing over states' rights and the institution of slavery. By law, Kentucky was a slave state. It was one of the "border states" in the Civil War, both geographically and politically, situated on the dividing line between the northern and southern regions of the United States. And it was one of only a few slave states that opted to stay in the Union. President Abraham Lincoln recognized the importance of the Commonwealth when he declared "I hope to have God on my side, but I must have Kentucky." Though the Commonwealth was officially neutral, its citizens were deeply divided over the issues that caused the Civil War, and over the war itselfa division symbolized by the fact that both Civil War presidents, Abraham Lincoln and Jefferson Davis, were Kentucky native sons. Most Kentuckians did not own slaves, in fact the enslaved population in all of Pike County had only increased from 78 slaves in 1830 to 98 in 1850. Kentucky had an overall population of approximately 1,150,000, of whom about 226,000 were slaves, and about 10,000 were free blacks. The state stood third in total population among the slave states. Kentucky was poor, and no planter owned over 300 slaves, only 7 owned over 100, and only 70 owned more than 50. On the other hand, with the exception of Virginia, Kentucky had more slaveholders owning from one to seven slaves than any other slave state. The major slave-owning areas in the state were the Bluegrass region, Henderson and Oldham counties on the Ohio River, and the western Kentucky counties of Trigg, Christian, Todd, and Warren. Many Kentuckians from these areas joined the Confederate army. SOURCE INFORMATION: Data imaged from National Archives and Records Administration. 1850: Pike, Kentucky; Roll: M432_217; Page: 474B; Image: 87. 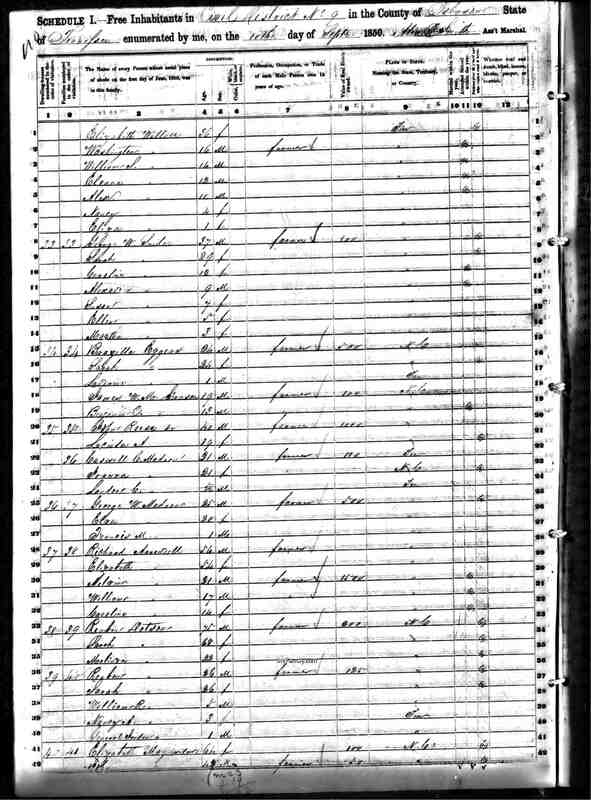 1860; Census Place: District 1, Pike, Kentucky; Roll: M653_392; Page: 0; Image: 514. The children of Jordan Dotson and Mary Wilson Dotson. Jordan, Jr., is the second from the left in front. 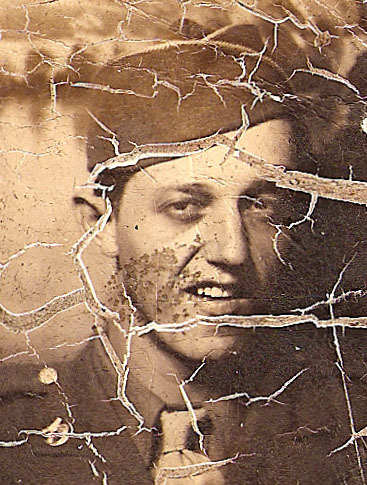 The others are unidentified (from the collection of Jordan Jr.'s family). Their son, GEORGE W. DOTSON, was the last of our line to be born in North Carolina, in 1837. Records differ on George's middle initial: Some say the "W" stands for Washington, while others say it stands for Wheeler (from an earlier relative). Whatever his middle name was, George W. traveled with his father to Kentucky, where he had some basic schooling. It was also at his father's farm where George married NANCY JANE DAUGHERTY (b. 1843 in Smythe County, Virginia) on August 1, 1861. Nancy was the daughter of HIRAM M. DAUGHERTY and KEZZIAH WHITEHEAD. After the wedding, George and Nancy started a farm next to his father's, at Big Branch in District #7 of Pike County. Our ancestor was probably a Confederate: A George W. Dotson enlisted with Company H of Diamond's 10th Kentucky Cavalry ("The Yankee Chasers") on May 15, 1863. Diamond's unit was from eastern Kentucky and southwest Virginia.⁷ Meanwhile, George's in-laws were devout Union supporters (brother-in-law Hiram Mahlon Daugherty was a surgeon in the 39th Infantry). That means that if our family wasn't exactly brother-against-brother in the Civil War, it was at least brother-in-law vs. brother-in-law. In 1861 and 1862, Kentucky saw a number of battles and skirmishes. By the end of 1862, after the battle of Perryville, Confederate forces retreated from the state. But the destruction caused by the war was not over for Kentuckians. From December 1862 to January 1865, Confederate raids by John Hunt Morgan, Nathan Bedford Forrest, Quantrill, and "Sue" Mundy destroyed Union supply depots, bridges, county courthouses, and people's personal property. Kentucky also experienced a period of lawlessness in 1864, when "Bushwhackers"small bands of unruly soldiers from both sideslooted small towns and robbed local farmers of produce and livestock. Meanwhile, battles were fought practically in the Dotson back yard: On May 16, 1864, there were two skirmishes at Pond Creek. But Kentucky changed drastically after the end of the Civil War. Slavery had been abolished, and while this saved millions from the horrors of that practice, it also destroyed the economy of slave states like Kentucky. Slaves became paid laborers, and farmers could no longer make enough money to pay them. The agricultural trade was crippled, with factories closing and trade businesses crippled and bankrupt. Soon, mining companies began to buy farmers out, paying a fraction of what the land had been worth before the war. Meanwhile, these farmers were not prepared for any other kind of career. Most of them could only read and write enough to sign a sales receipt. Soon they would be working in the mines on land they once owned for very little pay, practically turning them into indentured servants, themselves. SOURCE INFORMATION: Data imaged from National Archives and Records Administration. 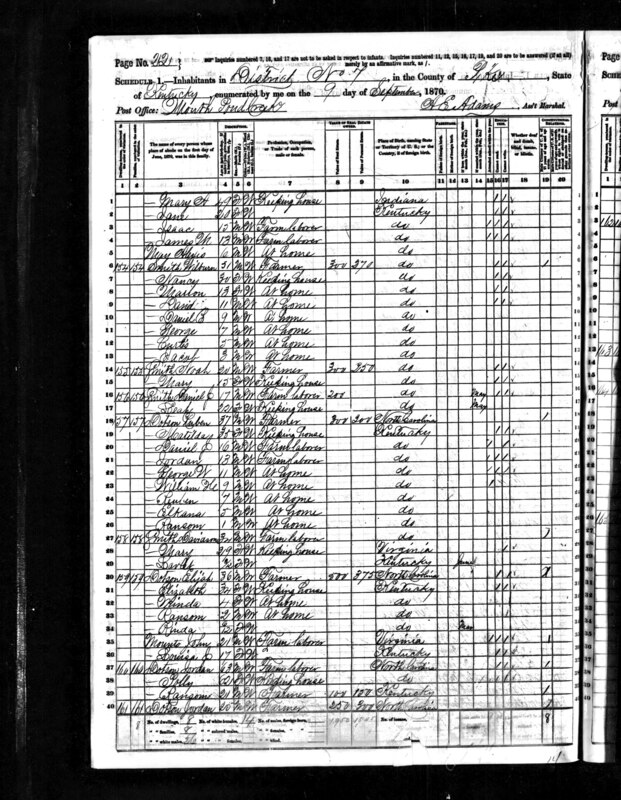 1870 Federal Population Census. M593, 1,761 rolls; part of Minnesota T132, 13 rolls. Washington, DC: National Archives and Records Administration. Census Place: District 7, Pike, Kentucky; Jordan: Roll: M593_495; Page: 94; Image: 191. George W: Roll: M593_495; Page: 87; Image 176. In the 1870 census, they live near the Mouth of Pond Creek, and George is a farmer. They apparently rent the land, as no value is given to their farm property. The census taker lists George as being able to read and write, while Nancy can only read. Meanwhile, their son, eight year-old HARRISON, is attending school. Other children listed at home are Arena (age 4), Kizziah (age 3) and John B. (age 1). One more child would be added in 1875, George W., Jr.
HARRISON DOTSON, b. in 1862. He married ARMINDA WOLFORD on 27 Apr 1883 in Pike Co., KY. Family listed below. They are buried in the family cemetery at Bone's Branch, Phelps Pike County, Kentucky. He died on 17 Oct 1938. 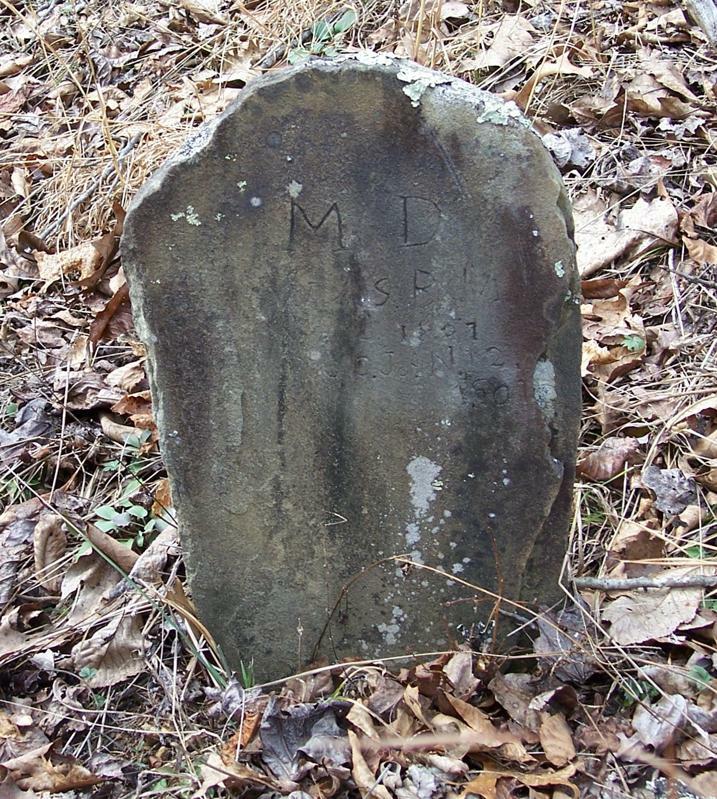 She died on 2 Jun 1951 in Pike Co.
MARY E. DOTSON was born in 1864. ARRENA DOTSON was born in 1866. She married Richard Blankenship (b. Jul 1859) on 4 Aug 1882 in Pike County, Kentucky. 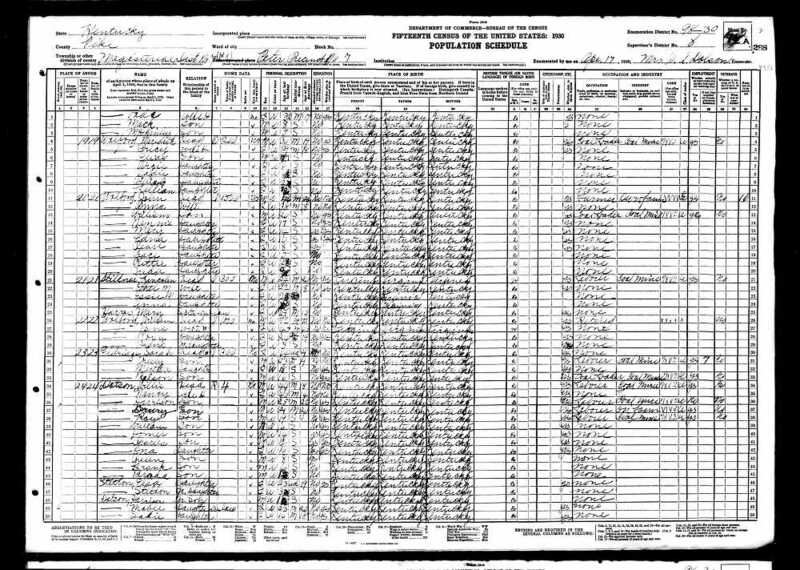 The 1900 Census shows that after her father's death, Arrena and her husband lived with her mother, Nancy Jane Dotson, as well as Marry E Dotson, and Nancy's grandchildren, Arminda Dotson (5) and Arfin Jane Dotson (2). KEZIAH "KIZZA" DOTSON was born in 1867. She married John Raines (1872-1925) in about 1888 in Pike County and had the following chiuldren: Rena (b. 1889), Nancy (b. 1890), Ibby (b. 1892), Iffa (b. 1892), Richard (1895-1951), Rebecca (1899-1967) and Lona Raines (b. 1904). She died on 31 Aug 1942 in Pike, Kentucky. JOHN B. DOTSON was born in Oct of 1869 in Pike Co., KY. He married his cousin Mary "Polly" Wolford (b: Nov 1863 in Pike Co., KY) on 1 Dec 1887 in Pike Co. They had the following children: Anie Dotson b: Sep 1888; Calvin Dotson b: Oct 1891; Stella Dotson b: Jan 1894; Vada Dotson b: Jun 1895; and Grayson Dotson b: Jul 1898. GEORGE W. DOTSON, JR. was born before 1875. He married Tennessee Blankenship (b: 1882) in Pike Co, Kentucky, and they had the following children: Esther Dotson b: 1900 in Pike Co, Ky; William Billy Dotson b: 1902; Ora Dotson b: 8 Oct 1906; Virginia Ginny Dotson; Edith Edie Dotson; Stewart Dotson; Mary Dotson; Wheeler Dotson; and Grant Dotson. At right is a photo of him @ 1872. 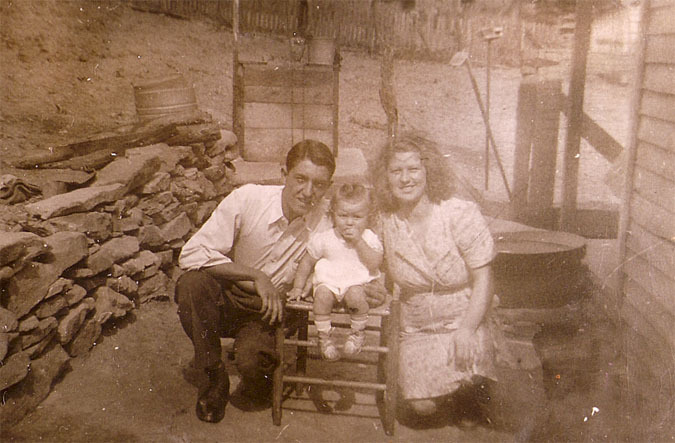 Click here to see George & Tennessee Dotson posing with Larry and Mary (Barker) Maynard. The grave of George W Dotson at the Smith-Crater Cemetery in Phelps, Pike County, Kentucky (click to enlarge). Times were very hard in Pike County. The economy of the area was changing drastically. You could no longer survive by farming alone, because the coal mining industry had taken over, and either buying out the farmers and creating mining towns, driving them out of business. The existence of coal deposits in the area was well known to early explorers and to early residents, but there was no vast commercial market for it due to transportation problems common to hilly terrain with secondary roads which were often little more than trails. But on March 12, 1883, the first carload of coal was transported from Pocahontas in Tazewell County, Virginia, on the Norfolk and Western Railway. This new railroad opened a gateway to the untapped coalfields on the borders of West Virginia and Kentucky. Virtually overnight, new towns were created as the region was transformed from an agricultural to an industrial economy. SOURCE INFORMATION: Year: 1880; Census Place: Peters Creek, Pike, Kentucky; (LEFT) Series: T9 Roll: 439 Page: 669. (RIGHT) Roll: T9_439; Family History Film: 1254439; Page: 660.4000; Enumeration District: 101; Image: 0177. 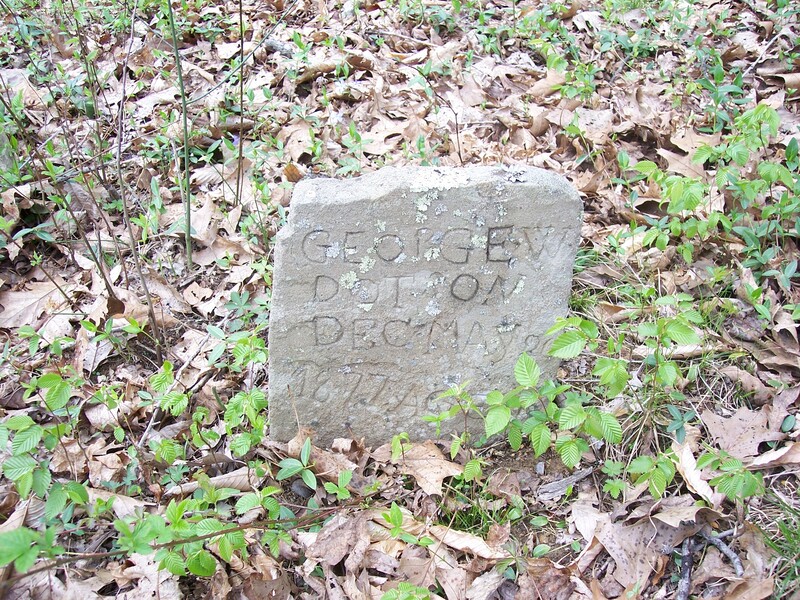 While times were tough for most farmers, the Dotson family had it much worse: George died in 1875 at the age of forty. The circumstances are unclear, but the family soon fell apart. 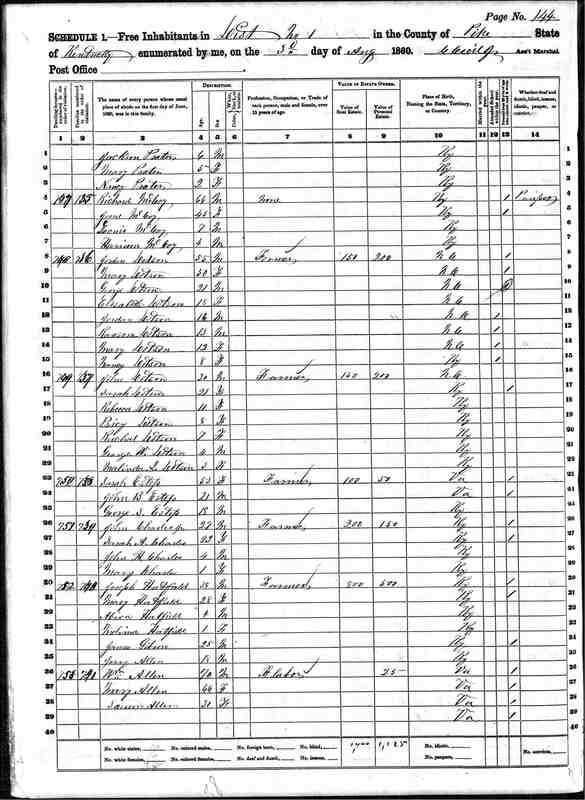 In the 1880 census, his widow Nancy is raising their son George W. near Peters Creek, while her children John B. and Keziah were living with 75 year-old Grandpa Jordan and Grandma Polly, working the farm. Arena was living nearby with G.D. Dotson and his wife, Elizabeth, as a laborer. 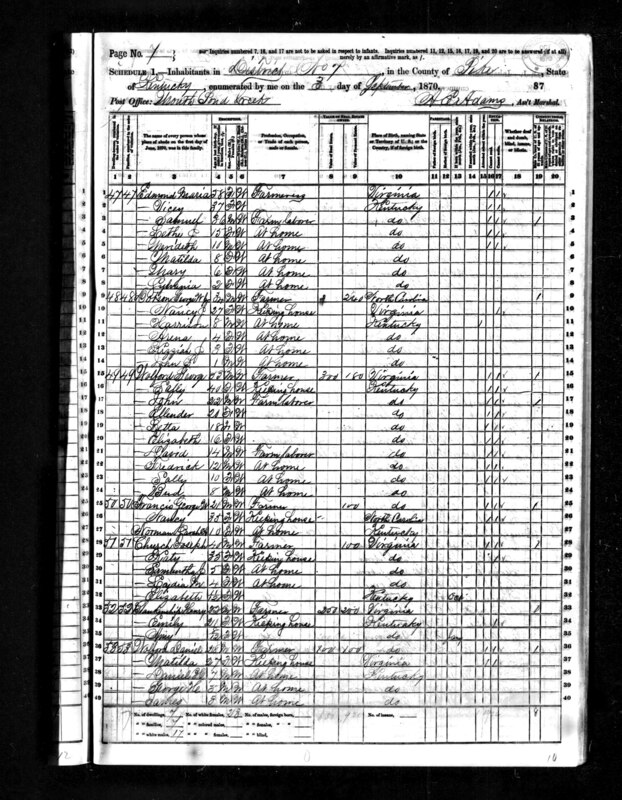 George's eighteen year-old son, HARRISON DOTSON, was nowhere to be found on the census, so it can be assumed he was an itinerant day laborer until he could find a permanent home. Fortunately for our family, a year later, Harrison would reappear in the public record and marry ARMINDA WOLFORD, the daughter of Civil War Veteran DANIEL "BONE" WOLFORD (on the Union side) and his aunt SARAH "SALLY" DOTSON, on August 1st, 1881, in Pike County. WILLIE DOTSON was born on 18 May 1884 in Pike Co., Kentucky. He married NANCY McCOY (06 May 1887 - 31 Aug 1960). He died 29 Dec 1966 in Pike, KY.
GREEN D. DOTSON was born on 6 Jun 1888 in Pike County, Kentucky. He married Lula Norman (1 Apr 1894 - Jun 1979), and they had a daughter, Zettie Marie Dotson (8 Nov 1912 - 26 May 1981). On 25 Feb 1913, a son, Green, was stillborn. Green Sr. died on 18 Sep 1974 in Phelps, Pike, Kentucky. FRANCIS MORSE DOTSON was born on 06 Dec 1891. He married Mattie Dalby "Dollie" Preece (7 Jan 1900 - 12 Nov 1986). Photo at right: "Frank M. Dotson with Audley Alley on the left, flashes the smile everyone loved. He had a perfect command of penmanship, taught school, and was a bookkeeper & postmaster for years." He ran a general store and post office with Mattie for more than 30 years, which was a favorite gathering place in the community. Francis died on 16 Jan 1962. MARY DOTSON was born in 1900. She married Lew Hubbard Preece (17 Dec 1898 - 31 Aug 1970), and they had the following children: Clarance Hubbard (1920-1988), Lula (B. 1922), Chester (1924-2001), Madeline (1926-2005), John (b. 1927), Irene (1929-1995), Corrine (1931-1987) and Paul Preece (1935-2005). Mary died on 16 Dec 1964. ANTHONY DOTSON was born on 20 Sep 1909. He married Mary Wolford (28 Jul 1915 - 4 Sep 1987) and they had three children: Marie (b. 1935), Jettie (b. 1937) and Reba Dotson (b.1939). He died on 26 Feb 1988. 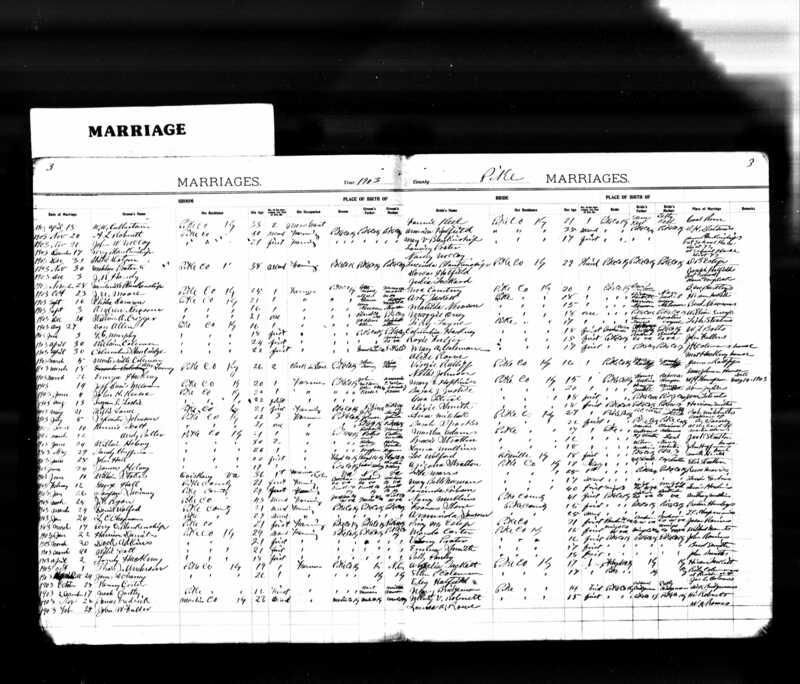 SOURCE: Kentucky Birth, Marriage and Death Records - Microfilm (1852-1910). Microfilm rolls #994027-994058. Kentucky Department for Libraries and Archives, Frankfort, Kentucky. 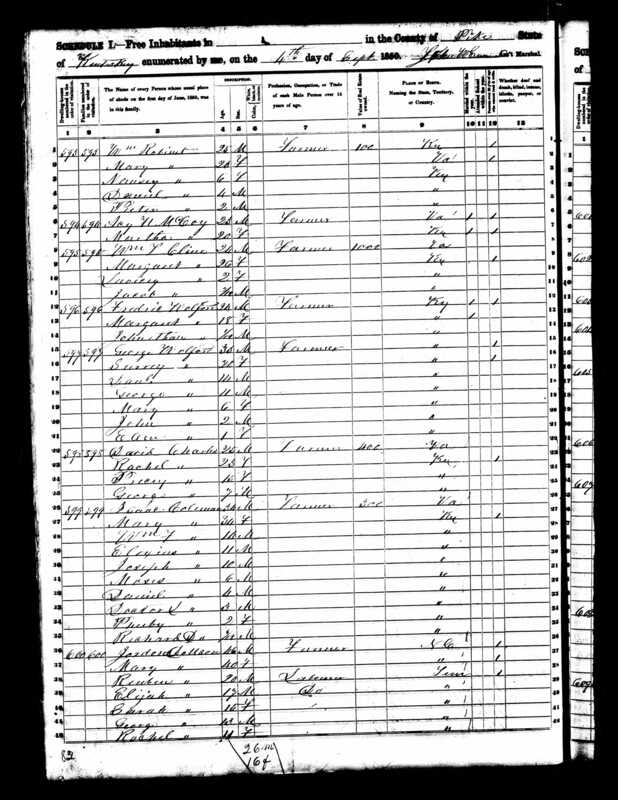 Harrison Datsun (sic) and his wife, Arminda, are listed on the 1920 census, right above their son, WILLIE DOTSON, and his family. Willie never learned to read or write, according to the census, but he was a legendary character in the familyfrom tales of moonshining and hiding from the revenue men, to even the person he married, who herself came from a very legendary family. On New Year's Eve, 31 Dec 1903, Willie married NANCY McCOY at the District 73 school house in Pike County. 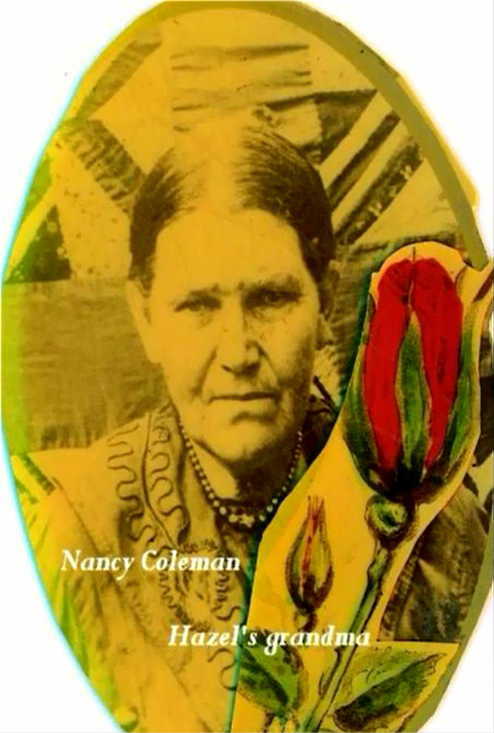 Nancy was a descendant of the McCoy side of the infamous Hatfield / McCoy feud. During the latter half of the nineteenth century, the bloody rivalry made front page headlines all over the United States, and even became romancticized and turned into Broadway shows and movies. But the ways of Appalachian Culture were changing quickly. Times had changed in the area for the Dotsons and other residents, and farming was no longer the main trade. The coal companies had set up a system that gave them total control of the town and the people. The houses, hospitals, stores and even the churches were company property. Miners worked in company mines with company tools, blasting powder and equipment, which they were required to purchase or lease. The housing for their families consisted of rough lumber with no indoor plumbing, and the rent was deducted from their pay. When there was illness, the company doctor was called in, and the miner had that expense deducted from his wages. The company stores charged over-inflated prices, since there was no alternative for purchasing goods. To ensure that miners spent their wages at the store, coal companies developed their own monetary system. Miners were paid by scrip, in the form of tokens, currency, or credit, which could be used only at the company store. Therefore, even when wages were increased, coal companies simply increased prices at the company store to balance what they lost in pay. The entire system was built around keeping the workers poor. More than one miner would pick up an empty pay envelope because his indebtedness had taken all he earned. In addition to the lousy economic conditions, safety in the mines was of great concern. Deadly methane gas, being odorless, was a silent killer, but far more miners died of black lung, a disease where the air sacs of the lungs are destroyed from breathing coal dust. The coal companies refused to recognize black lung as a valid medical disability caused by working conditions. Many company doctors would diagnose respiratory disorders as nearly anything but black lung. Historians have suggested that during World War I, a U.S. soldier had a better statistical chance of surviving in battle than did a West Virginian working in the coal mines. Fortunately, Willie was able to avoid this fatebut the alternative he chose may have been even more dangerous. 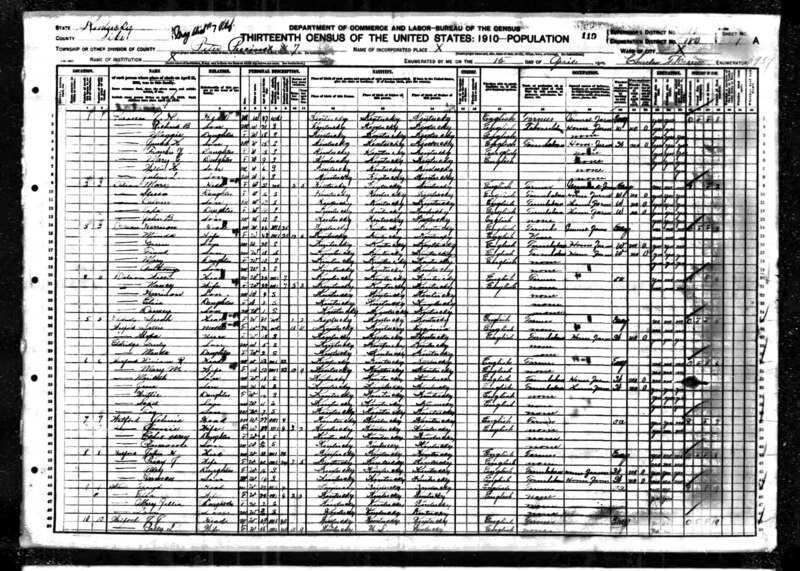 SOURCE INFORMATION: 1910 US Census data; National Archives and Records Administration. Washington, DC. 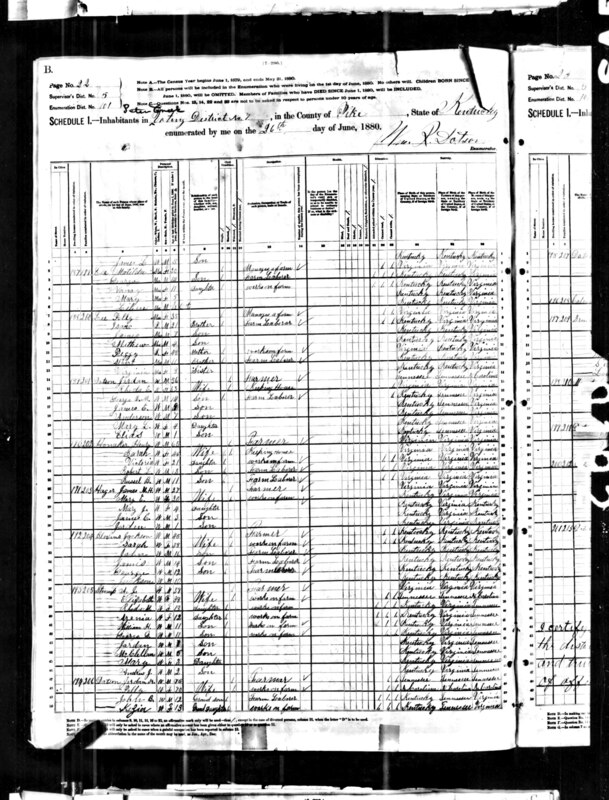 Peter, Pike, Kentucky; Roll: T624_499; Page: 1A; Enumeration District: 180; Image: 892; 1920 US Census data; National Archives and Records Administration. Washington, DC. Peter, Pike, Kentucky; Roll: T625_596; Page: 2B; Enumeration District: 130; Image: 805. Proud mountain people, Willie and Nancy became moonshiners to augment their farming income. Kentucky's tobacco and whiskey industries had boom years during the teens, but the Eighteenth Amendment (Prohibition) seriously harmed the economy, which led to widespread bootlegging. According to the The Kentucky Encyclopedia, by John E. Kleber, a moonshiner like Willie could easily make $300 per month, in a time when most miners just went further into debt with each pay period. During this time, revenue agents seized an average of a hundred stills per year and 20,000 gallons of distilled spirits. To keep from being caught, Willie and Nancy hid the moonshine under fence posts, so the revenuers wouldn't find it, and delivered the 'shine by horse around the mountains. Bootlegging was one of the few ways a farmer like Willie could still make a living in the areaand compared to the mining industry at the dawn of the 1900's, bootlegging seems pretty honest! 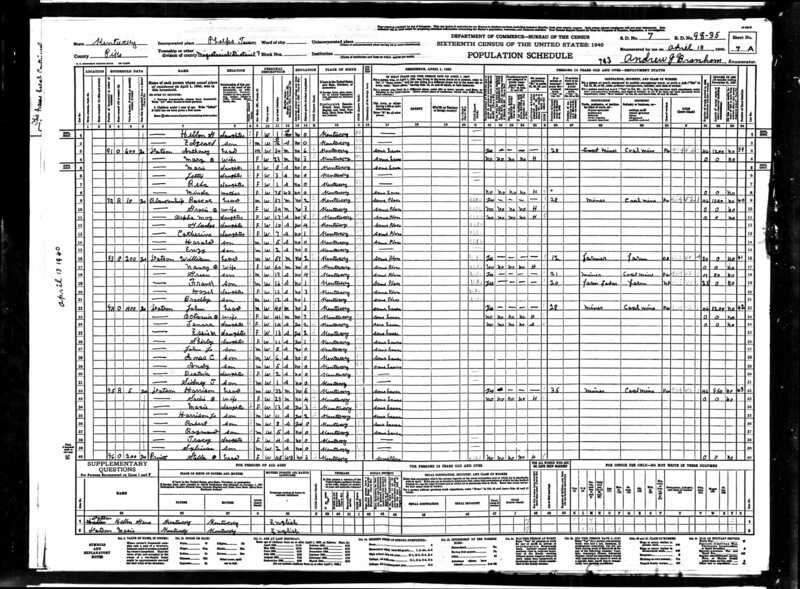 SOURCE: Year: 1930; Census Place: Peter, Pike, Kentucky; Roll: 775; Page: 2A; Enumeration District: 30; FHL microfilm: 2340510. 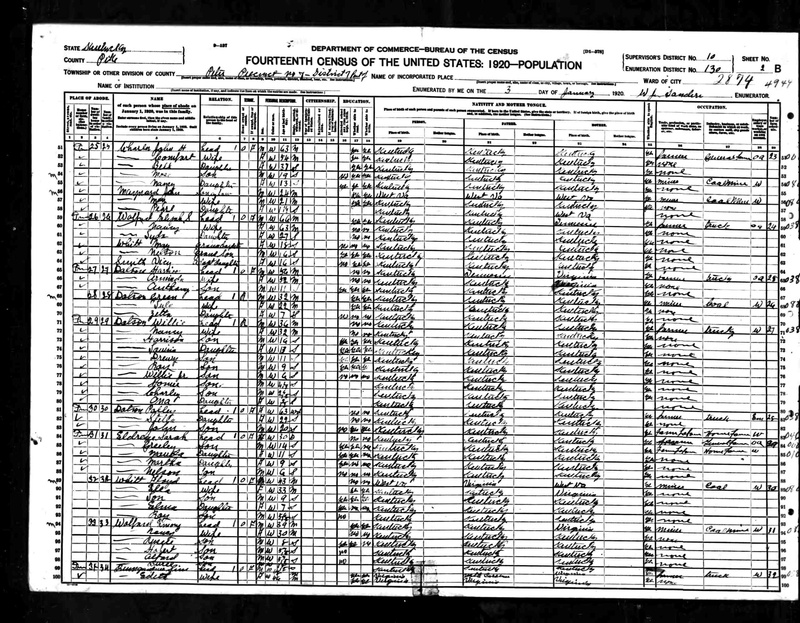 Year: 1940; Census Place: Phelps, Pike, Kentucky; Roll: T627_1351; Page: 7A; Enumeration District: 98-35. HARRISON DOTSON was born on 28 Jan 1905 in Pike County, Kentucky. He worked as a miner and married Sadie Blankenship (1908-1986) on 10 Aug 1965 in Clintwood, Virginia. They had the following children: Scott Dotson (1925-1925), Marie (b. 1927), Harrison "Lubrey" Jr. (1928-1998), Robert "Rob" (1931-1989), Raymand (b. 1935), Tracey (b. 1936), Sylvian (1937-1988), Teddy "Ted" (1941-2000), Estil (1947-2002) and Ruby Dotson (1952-2002). Harrison died on 9 June 1972 in Phelps, Pike, Kentucky. LOUISA "ELSIE" DOTSON was born on 8 Feb 1907 in Pike County, Kentucky. She married a man named Stilton, but was a widow in the 1930 census with one child, living with her parents. DREWY DOTSON was born on 14 Nov 1908. He married OCTAVIA WOLFORD (9 May 1926 - 16 Sep 2012) and they ad a daughter, Bernice (1952-2011). Drewey died on 25 Jan 1989 at 41528 Freeburn, Pike County, Kentucky. He's buried at Freeburn Community Cemetery. ROY DOTSON was born on 11 Nov 1911 in Pike County, Kentucky. Roy died in Mar 1978 in Phelps, Pike, Kentucky. WILLIAM DOTSON, JR. was born in 1914 in Pike County, Kentucky. JAMES DOTSON was born on 14 Feb 1915 in Pike County, Kentucky, according to Kentucky Birth, Marriage, and Death Databases: Births 1911-1999. Frankfort, Kentucky: Kentucky Department for Libraries and Archives. GREEN J. DOTSON was born 23 Feb 1921, the same year that Battle of Blair Mountain, the largest organized armed uprising in American labor history, occurred in Logan County, West Virginia. 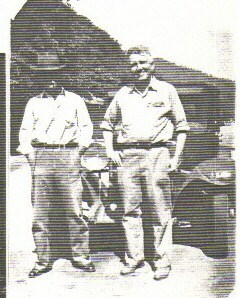 By 1940, he was working in those Logan County mines, himself. After marrying JACQULENE BALDRIDGE (children listed below) he served as a Warrant Officer during World War II. He then returned to the mines and died mysteriously sometime around 21 Dec 1957, driving home through the mountains after a union meeting. FRANK DOTSON was born in 1924. A Frank Dotson (listed as born in 1922) enlisted in the army on 8 Apr 1941 in Huntington West VA as a Private, and served until 4 Jun 1943. Education: Grammar school; Civil Occupation: Farm hand, general farms; Marital Status:	Single, without dependents; Height: 68", weight 129 lbs. BRADY DOTSON was born on 23 Jun 1928 in Phelps, Pike, Kentucky. He married Vesta Tosten (1930-2002). Brady died on 20 March 1981 in Pike county, Kentucky. 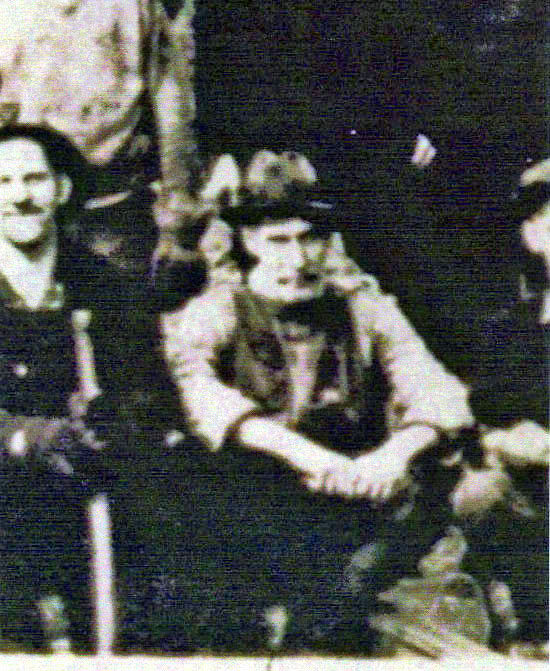 In order to prevent the penetration of unions into the mining industry, Baldwin-Felts Detectives (generally considered armed thugs) were hired to subdue the miners. They enforced rules such as the prohibition of gathering in large groups, going out at night or anything else that could lead to the discussion of forming a union. Slowly, union organizers penetrated the companies and secretly got the miners to come together. These conflicts brought about the 'Redneck War' between 1920-21 in the southwestern area of West Virginia, starting in Matewan, a small town in West Virginia that lies along the Tug River that divides Kentucky and West Virginia. The "Matewan Massacre" erupted on May 19, 1920, when twelve men were killed in a gunfight between town residents and agents of the Baldwin Felts Detective Agency. The Baldwin-Felts detectives had evicted six families and stacked their belongings outside the homes. Townspeople heard about the evictions and rushed into town with guns to confront the detectives. Police Chief Sid Hatfield then attempted to arrest Al Felts for evicting miners without Matewan authority. The miners and detectives faced each other. Someone started firing and then the melee broke out. Seven detectives were killed, including Al and Lee Felts, and two miners were killed as well. Matewan’s mayor Cabel Testerman eventually died from a gunshot as well. Hatfield eventually died 15 months later when the Baldwin-Felts detectives killed him at the McDowell county courthouse. The massacre led to the Battle of Blair Mountain, the largest organized armed uprising in American labor history, occurred in Logan County. For nearly a week in late August and early September 1921, between 10,000 and 15,000 coal miners confronted state and federal troops in an effort to unionize the mine counties. Private planes were hired to drop homemade bombs on the miners, and up to 30 deaths were reported on both sides, with hundreds more injured. By September 2, however, federal troops had arrived, and the fledgling United States Army Air Service had dropped a few bombs, and the miners dispersed the following day. It was the only time in history of our country that military planes were used against our own citizens. GREEN DOTSON, born on February 23, 1921, the year of the Battle of Blair Mountain. He attended grammar school, then began working as a semiskilled miner, and mining-machine operator. He was selected for military duty in World War II. Army records show that he enlisted as a 5'9", 146-pound private Warrant Officers on the 24th of November, 1942, in Huntington West Virginia, but listing Pike County, Kentucky, as his home. Warrant officers in the United States are technical leaders and specialists. After joining the army, Green married a wonderful, incredibly loving person named JACQULENE BALDRIDGE (13 Mar 1926 - 09 Dec 2003), in 1943. Green was then honorably discharged as a private from Company B of the 395th Infantry, 99th Division on 27 Nov 1943. They had their first child, a daughter, in 1944. Green then returned home to full-time work in another battleground, the coal mines in West Virginia, where the Battle of Blair Mountain had actually occurred. 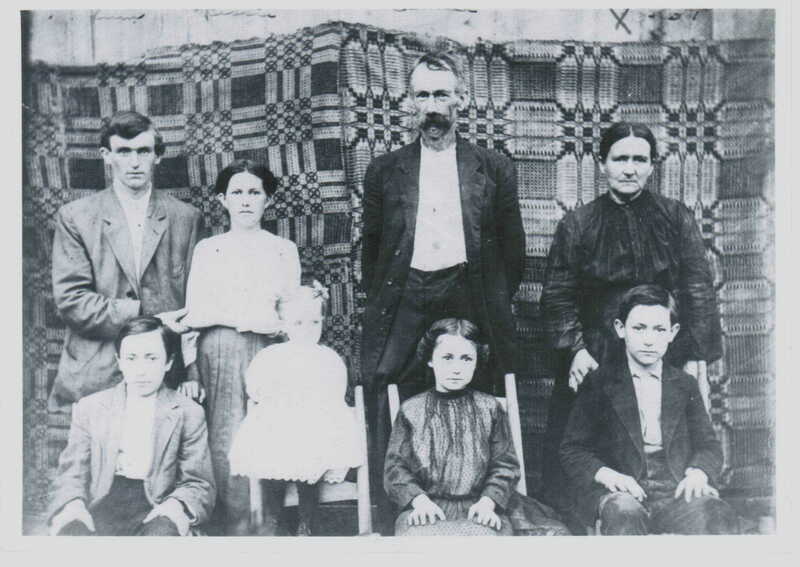 The family moved to Omar, Logan county, West Verginia, and raised a family. The mines in Omar were run by the West Virginia Coal and Coke Corp., who employed 2000 employees. 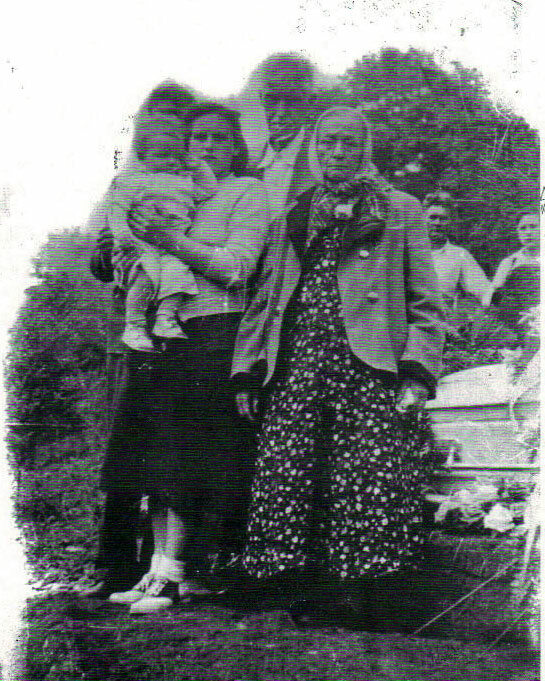 It was incredibly difficult at that time to raise a family on the pay of a miner in West Virginia. Life in Omar was highly structured and organized to accommodate employment in the mines. Housing in Omar was built and owned by the coal company for its employees. Several developments of smaller houses and duplexes were assigned to the miners. Household tasks were each done on a set day of the week, with washing on Monday, etc. Cleanliness was valued in the face of the daily challenge of dealing with cinders and coal dust from the many coal trains that passed through. Families were also affected by smoke that hung over the town from coal heaters and a slag heap near the mines.⁹ Green and Jacqulene lived in one of the company houses. Directions to Farnham Episcopal Parish. ¹North Farnham Parish (Old Rappahannock, 1683-1692; Richmond, 1692-), on the north side of the Rappahannock River, was formed in 1692. After the Revolution this Episcopal church was deserted for many years. Bishop Meade reported that the bricks of the wall around the plot had been used for hearths, chimneys, and other purposes and that the church itself was used 'as a granery, stable, a resort for hogs . . . For years it was also used as a distillery . . . while the marble font was circulated from house to house, on every occasion of mirth and folly . . . until at length it was found bruised, battered, and deeply sunk in the cellar of some deserted tavern.' The walls show bullet holes, scars of a skirmish during the War of 1812, when the Richmond County Militia repelled Admiral Cockburn's raiders. The church was restored in 1835, but during the War between the States was again stripped of its furniture and occupied by both Federal and Confederate troops. Restored, it was burned in 1887 and restored again in 1920-24. The communion silver and the communion font have been returned. Farnham Church is located in Farnham Virginia to the south and east of Warsaw Virginia. 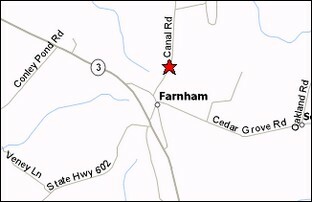 From Warsaw, Farnham is just 10 miles east of Warsaw Route 3 and a 10 minute drive. The church is at 211 Canal Road just to the west of Scotts Corner. ²John was listed as 18 years old on the original ship passenger list, and set sail from London with Captain John Smith in December of 1606. He is listed among a hundred and five men in the company that became the first settlers in Jamestown, arriving aboard the Susan Constant on May 13, 1607, as a labourer from the region of Lincolnshire. They reached the capes of Virginia and sailed up the broad river, thirty-two miles from the river's mouth. They named the river "James" and their settlement, Jamestown, in honor of their King. The colonists soon erected cabins out of poles and branches and some dug caves to live in. The site of the colony was unhealthy, and the deaths, especially during the first few years of the colony, were horrifying. From 1606 to 1618, eighteen hundred immigrants sailed from England for Virginia. At the end of that time only six hundred were living. Attacks by Indians, starvation, and the system of holding property in common added to the difficulties of the colonists. But in 1612 they began to grow tobacco and they began to fare better. In spite of all the hardships, John survived and was reported to have been an able hunter and fur trader. He was also a soldier in expeditions against the Indians. After the First Anglo-Powhatan War (1609 - 1613), the marriage of Chief Powhatan's youngest daughter Pocahontas and colonist John Rolfe in 1614 began a period of more peaceful relations between the English colonists and the Indians of the Powhatan Confederacy. But in the spring of 1622, after the murder of his adviser, Nemattanew, by an Englishman, Chief Opechancanough launched a campaign of surprise attacks upon at least thirty-one separate British settlements and plantations mostly along the James River. The Indian massacre of 1622 (also known as the Jamestown Massacre, shown below) occurred in the Virginia Colony on Good Friday, March 22, 1622. Almost a third of the English colonists were killed by a coordinated series of surprise attacks of the Powhatan Confederacy under Opechancanough. Fortunately, John had left the area to Charles City just before the massacre, so he survived. The Tax List of James City 16 Feb 1623 lists John Dods and Mrs. Dods as living at the Neck of Land near James City, now Chesterfield, Virginia. He was also listed on the Virginia musters of 1622 and 1624 at Neck-of-land, Charles City. In 1626 he is listed as owning 50 acres in Charles Cittie and another 150 acres in the Territory of Tappahanna. But proof that John and Jane ever even had children is scarce. Dods is one of only three 1607 settlers still alive in 1624, and there's no evidence that John or any of those surviving settlers ever had any kids. So we can only speculate that he is related to the ancestors in our line. 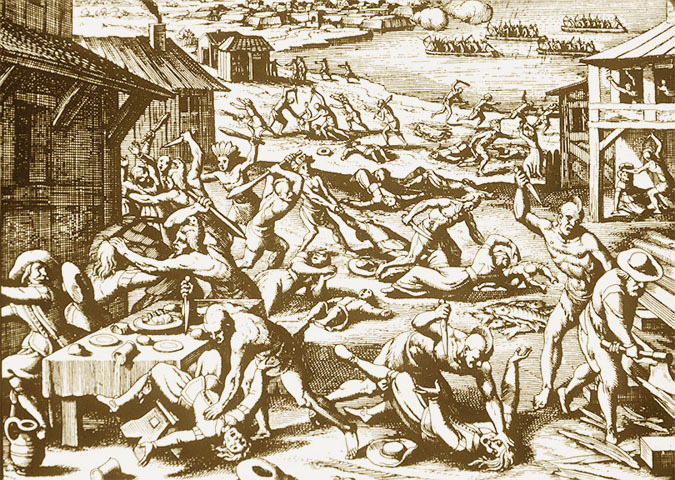 The 1622 Jamestown Massacre, as depicted in an etching by De Bry. 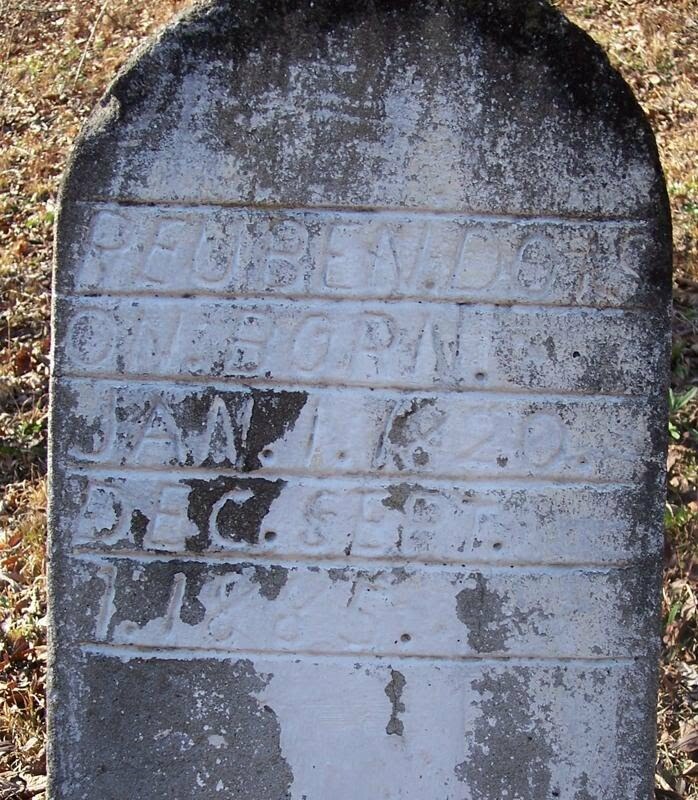 ³John Dodson sailed to America, then lived and died in Richmond County, Virginia (some say this is actually John Dods, although he wasn't close to eighteen years old in 1822). His son, JESSE DODSON, was born in 1620, probably in England, but sailed to the Colonies with his father (no son is listed with John Dodds). A 1979 article by Mrs. C. T. Dodson, of Wayne County, Kentucky, relates a family story handed down through the Centuries, in which Jesse chose his bride from of a ship load of eighty prospective wives arriving from England. A colonist could pay a woman's transportation fees (with her permission), in the amount of 120 pounds of tobacco, and secure her as a wife. It is by this method that Jesse and a brother, William, supposedly obtained wives. Jesse then married JUDITH HAGGER (b: 1627 in Wakefield, Yorkshire, England) on the 7th of May, 1645, in Jamestown, Virginia. Hagger is an ancient Pictish-Scottish name.  It is derived from the Gaelic form Mac-an-t-sagairt, which means son of the priest. Patronymic names often substituted the name of a saint or other revered religious figure in place of a devout bearer's actual father. However, the patronym Hagger often denotes actual paternity in this case, since the marriage of clerics in minor orders was permissible, although the marriage of priests was declared illegal and invalid during the 12th century. The Hagger name was first found in Perthshire, where they were seated from very ancient times, some say well before the Norman Conquest and the arrival of Duke William at Hastings in 1066 A.D. The Coat of Arms is a blue shield with a silver star. The family motto, "Modeste conabor," means "I will attempt moderately." ⁵Abraham Goad in his 1734 will in Richmond County named two daughters married to Dodsons: Elizabeth born 1795, was married to John Dodson, and Alice was the wife of Fortunatus Dodson, son of Charles, Jr. On 9 Feb 1699Will of William Smyth, husband of Eve witnessed by Mary “Doson”. Goads are heirs. On 24 April 1704 the Will of Eve Smith (Smyth), mother of Katherine (Williams) Goad was witnessed by William, Charles and Anne Dodson, and proved 4 Oct 1705 by Charles and Anne. Goad grandchildren are heirs. ⁶National Archives and Records Administration. Index to the Compiled Military Service Records for the Volunteer Soldiers Who Served During the War of 1812. Washington, D.C.: National Archives and Records Administration. Microfilm Publication: M602, Roll Box: 60. ⁷Another George W. Dotson was on the Union side, a Private in Co. H of the 39th Kentucky Infantry. But that George was still alive in 1890 and living in a different precinct of Pike County. ⁸Pike County was formed on December 19, 1821 from a part of Floyd County by act of the General Assembly of Kentucky under Governor John Adair. Pike County was named in honor of General Zebulon Pike. The first Pike County court was held on March 4, 1822 at the home of Spencer Adkins which was located just below where Levisa Fork meets the Russell Fork of the Big Sandy. A commission was appointed on March 25, 1822 to select a permanent county seat. Elijah Adkins donated one acre of land for the courthouse and was surveyed by James Honaker on March 23, 1824. The first courthouse was to be of hewed logs 24 feet square and 1 1/2 stories high covered with shingles. The first Post Office was called Pike and Will Smith was Postmaster. The name was changed to Piketon in 1829 and William Williams was Postmaster. The name was changed to Pikeville in 1881 and Lewis C. Dils was Postmaster. The first census of the city of Pikeville list 7 families with a total of 49 persons; 34 of those people were under 30 years of age. ⁹Omar, West Virginia, is located in mountainous country with narrow bottom lands on a tributary, Main Island Creek, that flows into the Guyandotte River, which flows into the Ohio. The streets of downtown Omar were landscaped with rows of trees. 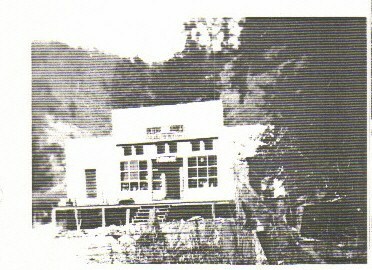 The multi-storied company store in Omar was called the Junior Mercantile. It accepted scrip, which was available at the company office nearby. The store included brand name clothing, groceries, a pharmacy, and other goods. Other buildings included churches, a pool hall, a restaurant, and a large movie theater. There was also an office for the company doctor. There was a large elementary/junior high school building for white children and another school building for black children. (The high schools were in Logan - Logan High School for the white students and Aracoma High School for the black students.) The Omar Project: Not a Simple Story by the West Virginia Division of Culture and History. "Ancestors of Robert Dodson and his descendants" by Mrs. C. T. Dodson, 1965. "Supplement to the History of the Dodson-Dotson Family of Southwest Virginia," by Rev. Silas Emmett Lucas, Jr. Southern Historical Press, 1966. 124 p.
THE 10TH KENTUCKY CAVALRY, C.S.A. - THE YANKEE CHASERS, by John B. Wells III and Jim Prichard, Gateway Press, 1996. 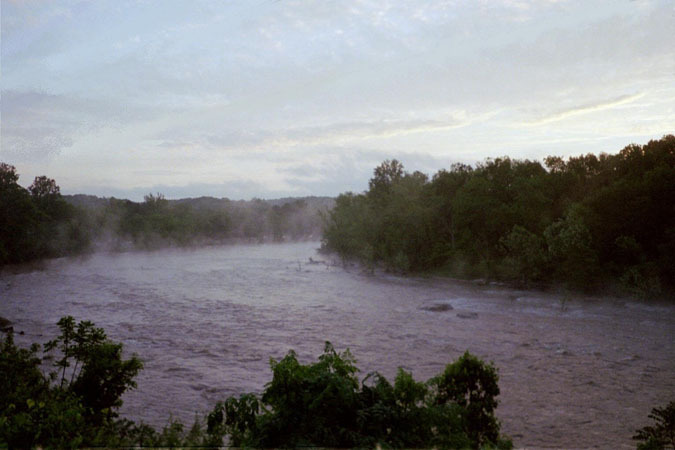 The Rappahannock River in Old Rappahannock County was organized from Lancaster County, Virginia in 1656. In 1692, Richmond County, on the north side of the river, and Essex County, primarily on the south side of the Rappahannock, were organized from Old Rappa, which was then abolished.